Built: Originally in 11th century? 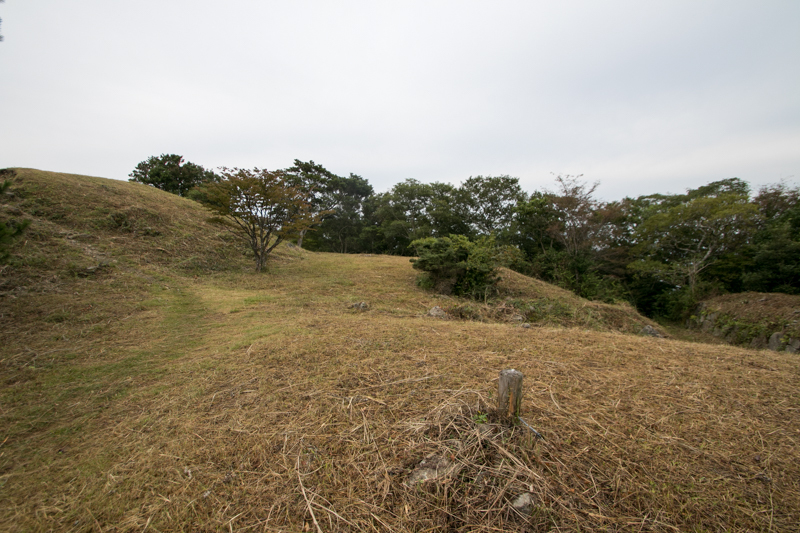 Takatoriyama castle (鷹取山城) is built over Takatori-yama mountain. 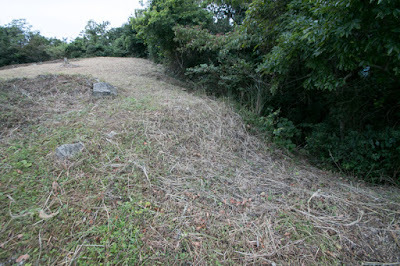 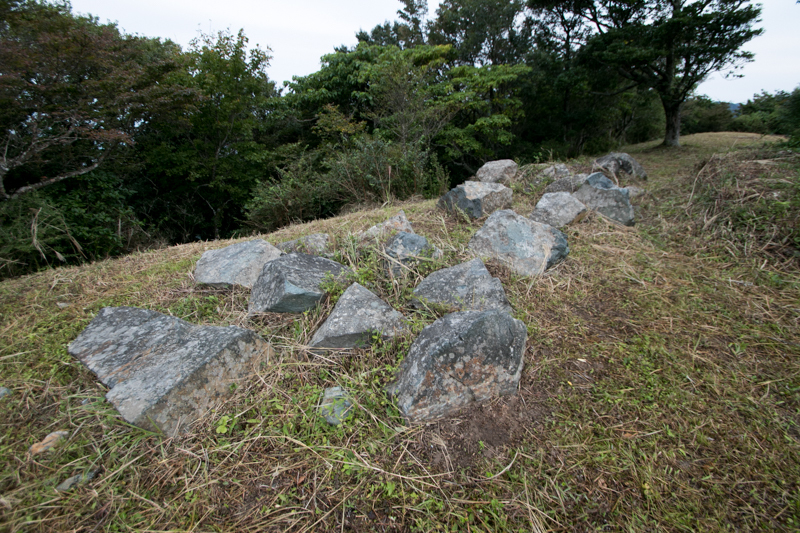 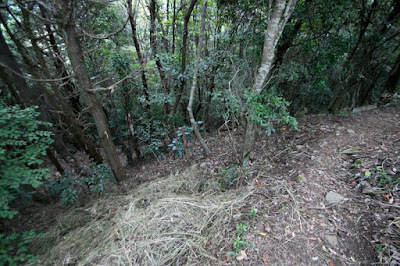 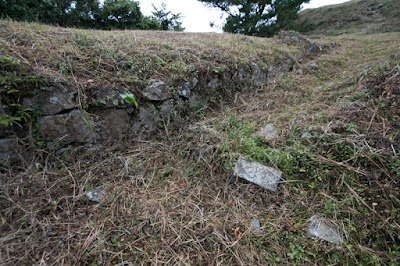 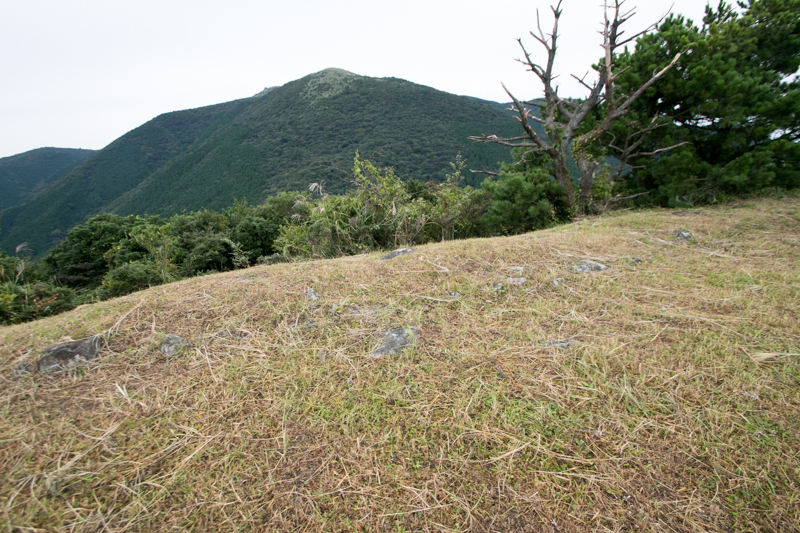 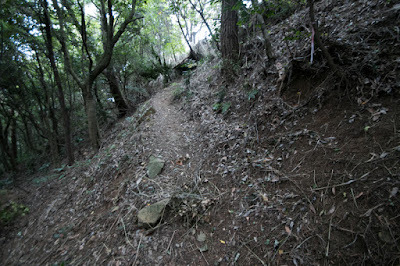 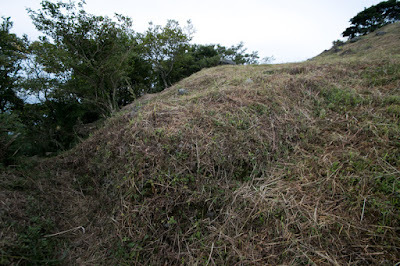 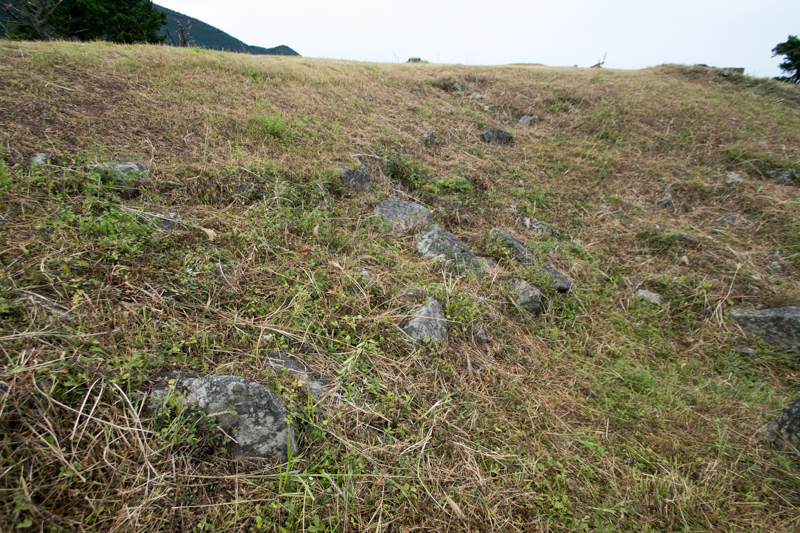 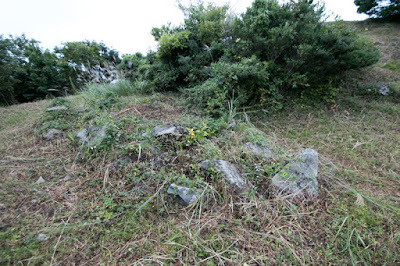 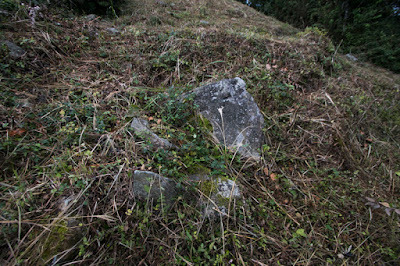 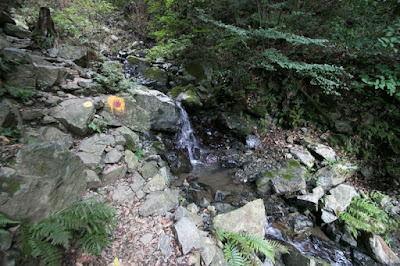 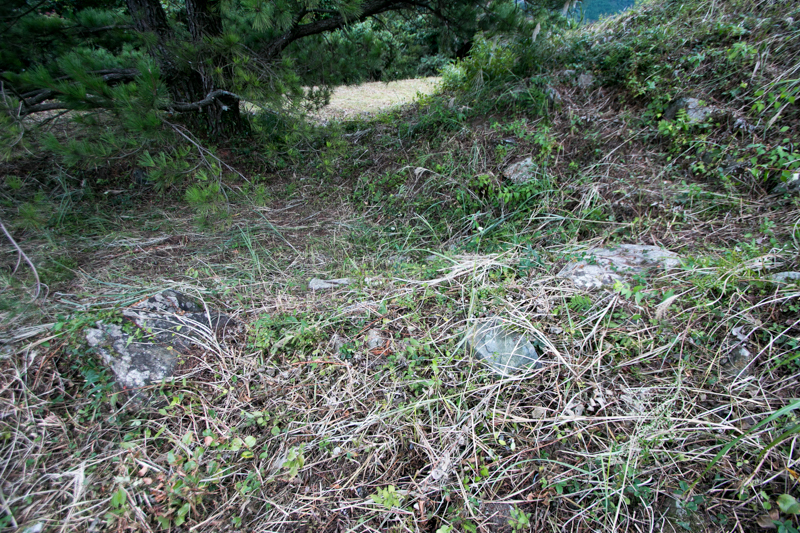 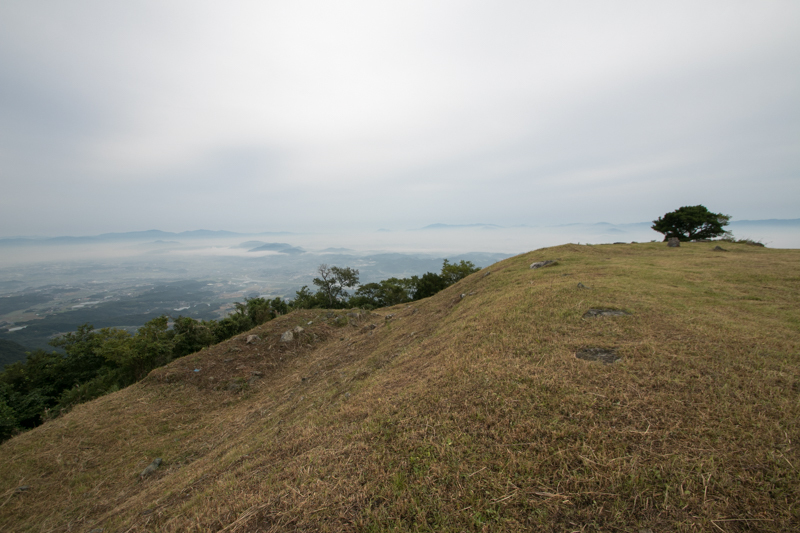 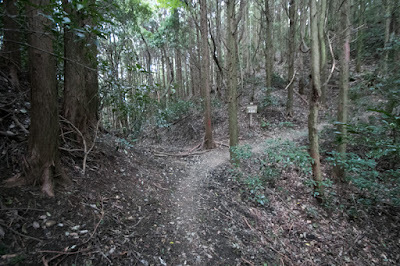 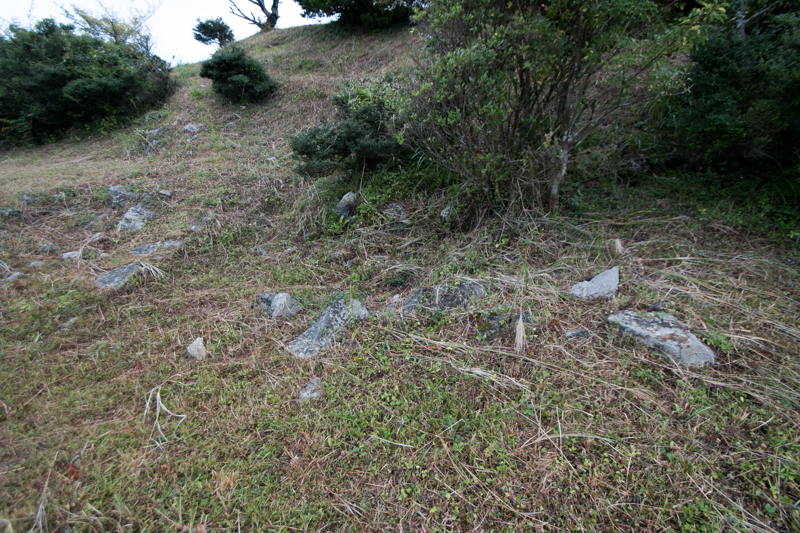 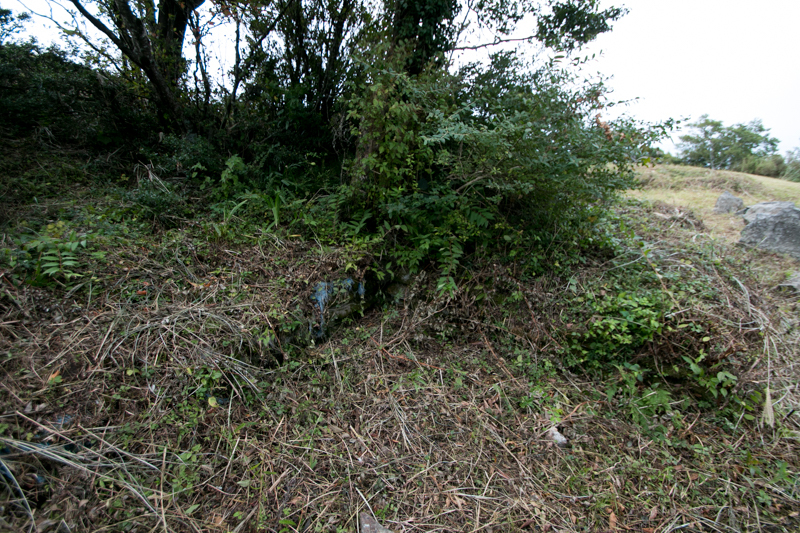 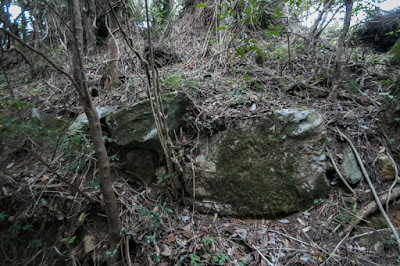 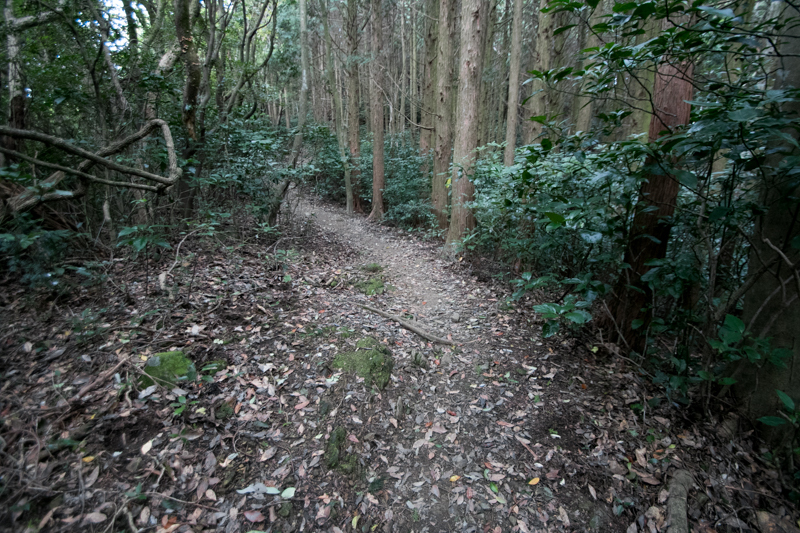 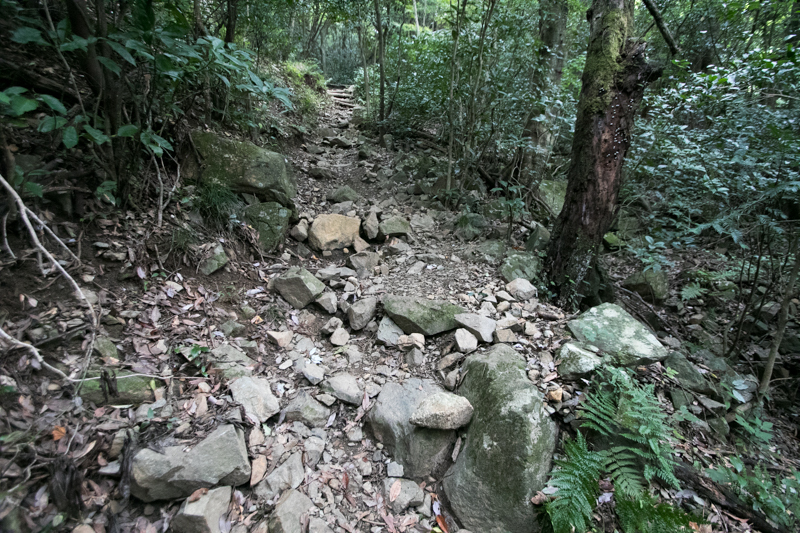 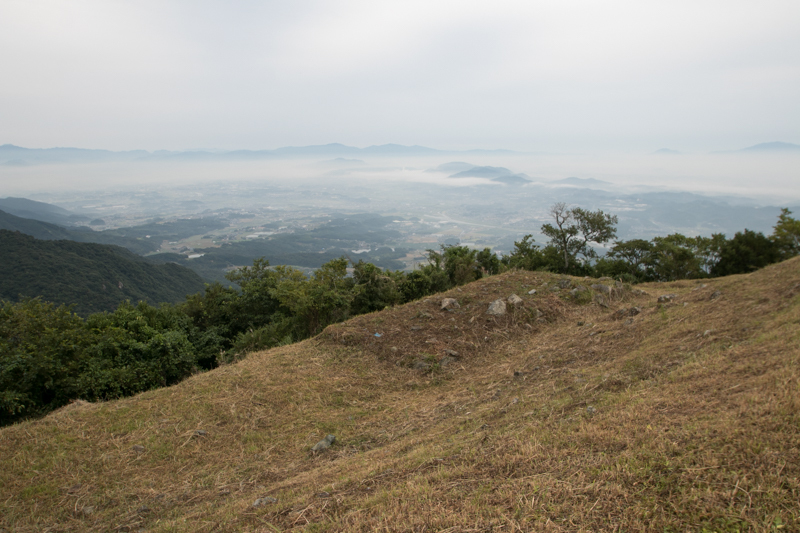 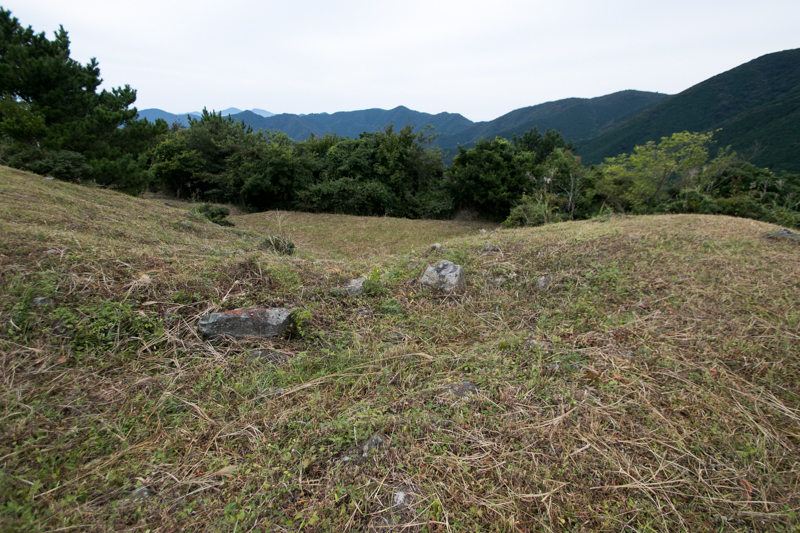 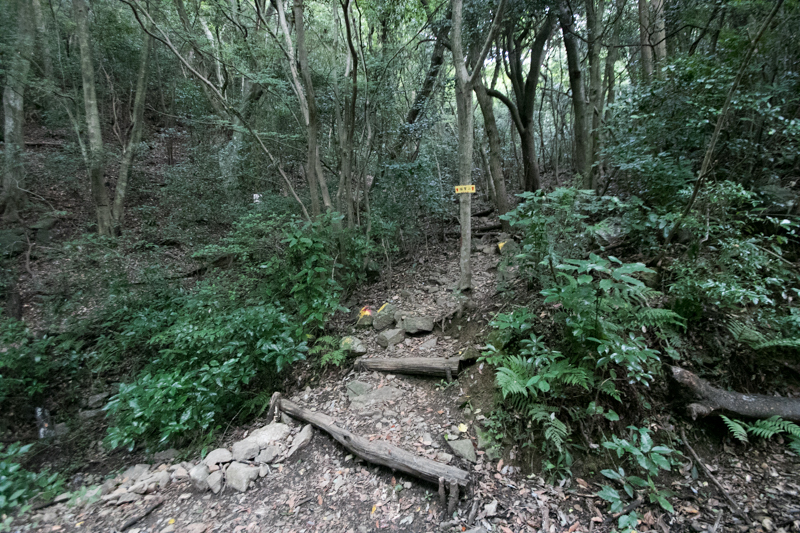 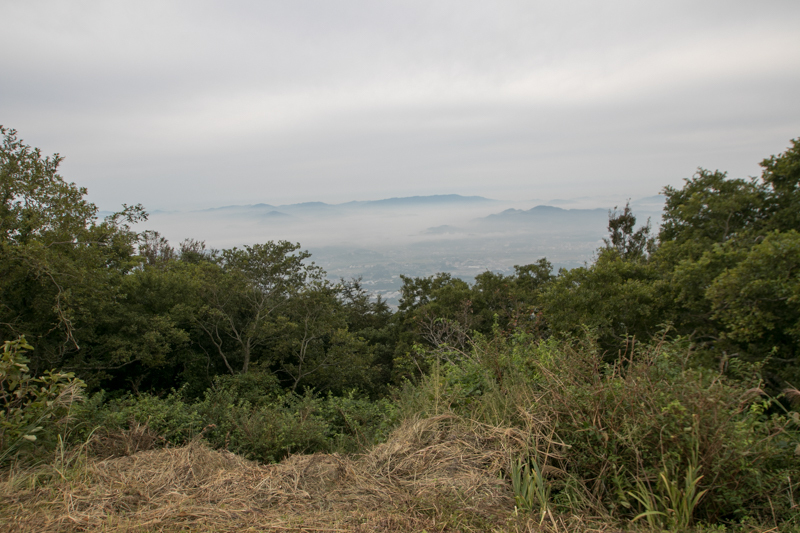 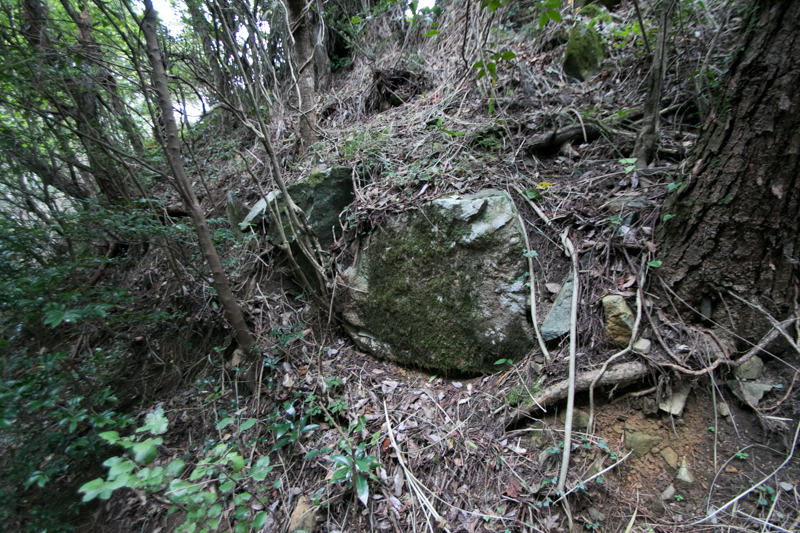 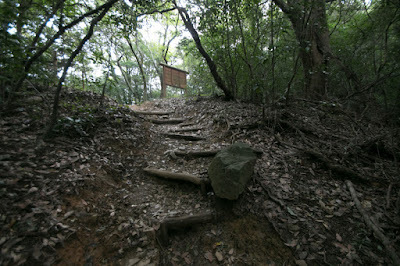 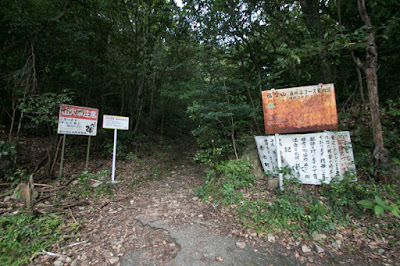 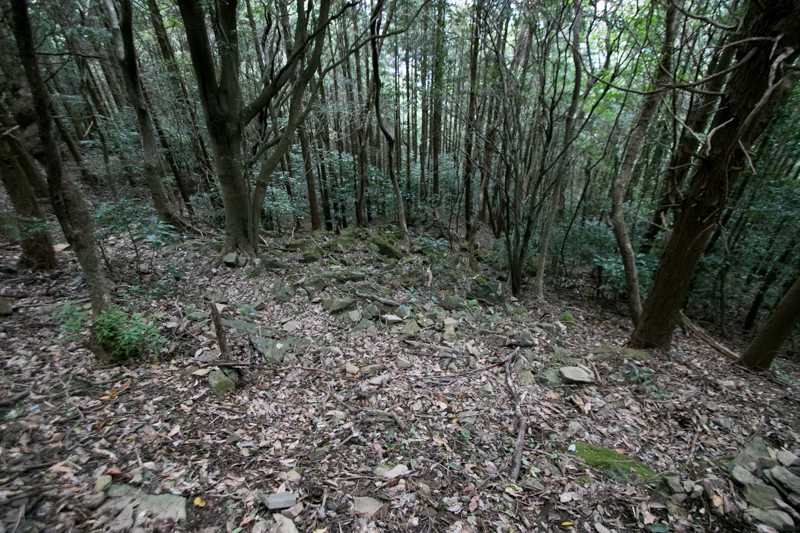 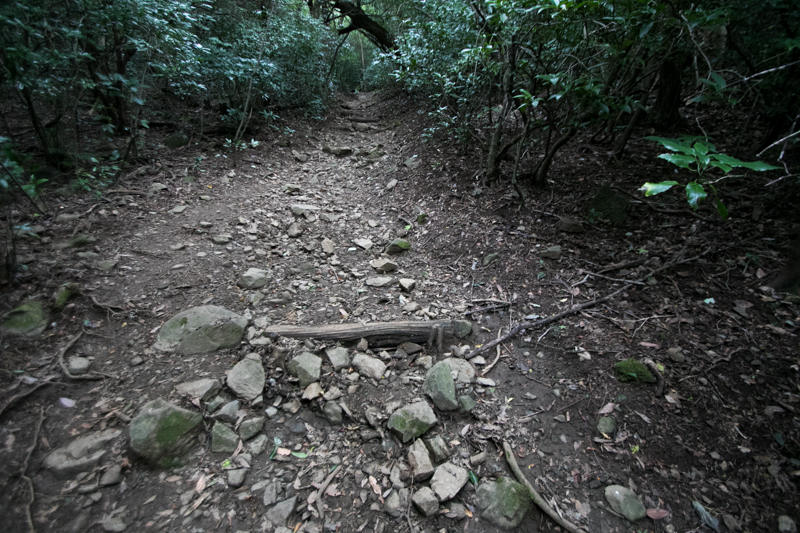 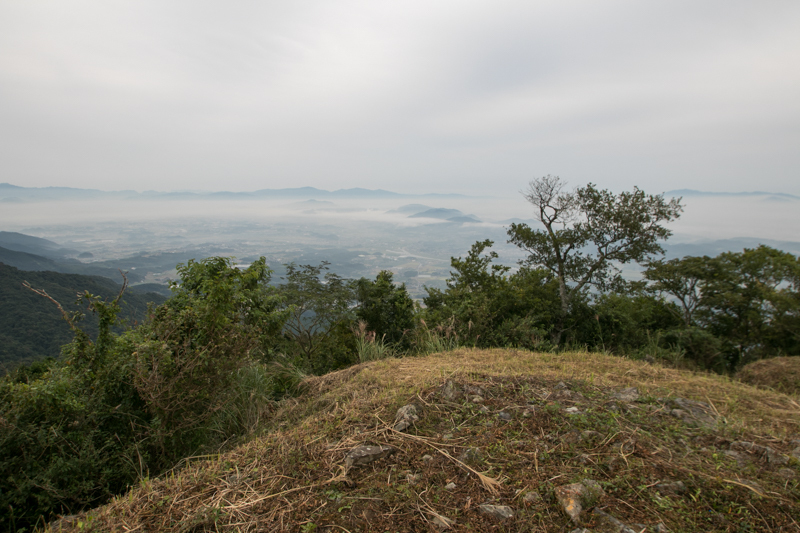 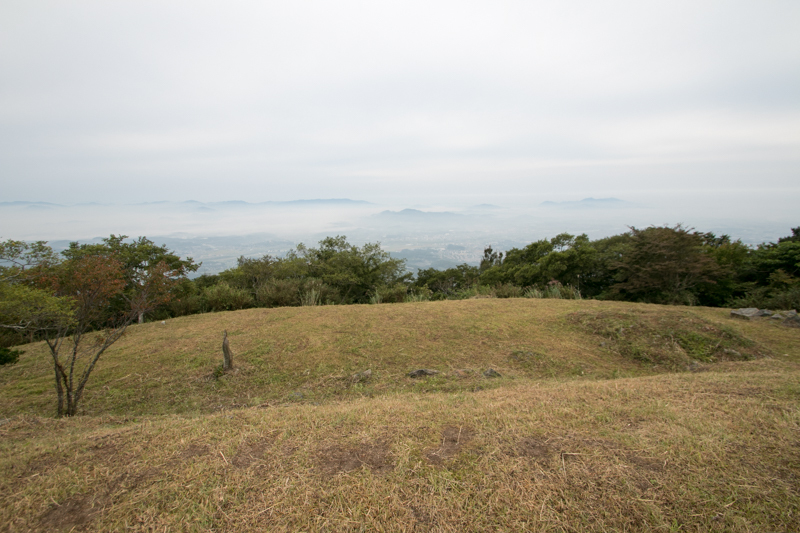 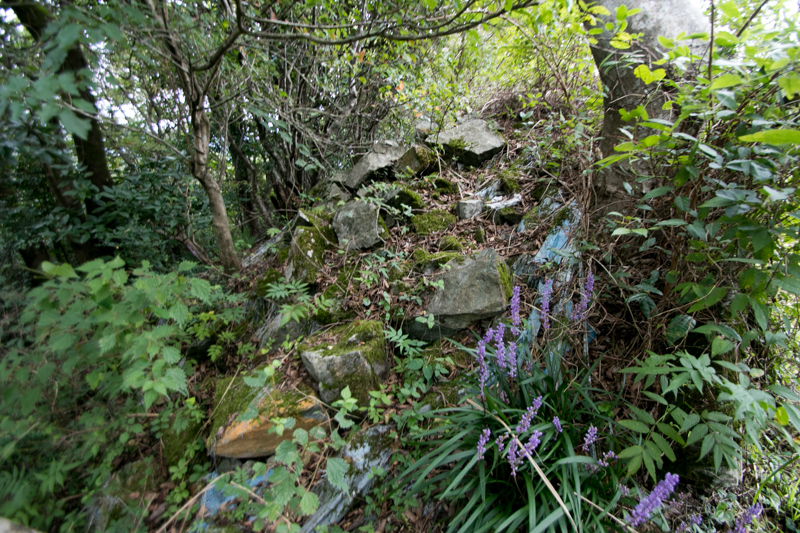 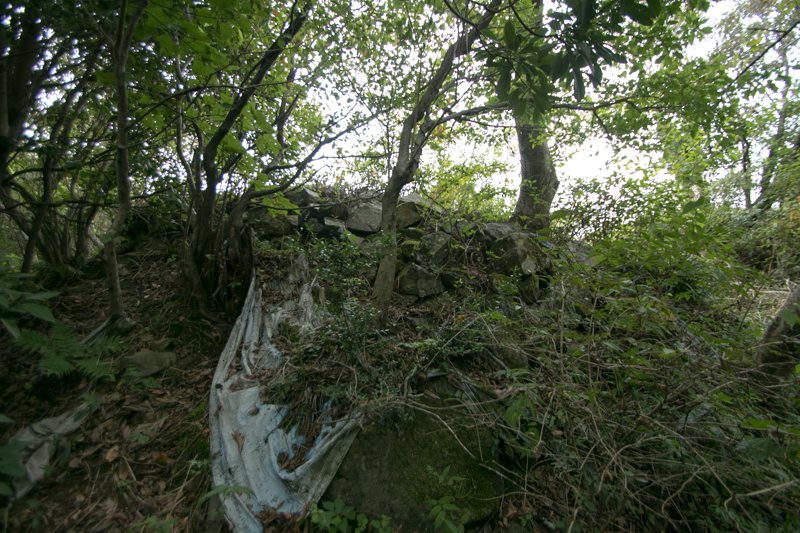 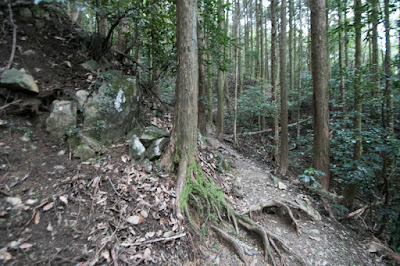 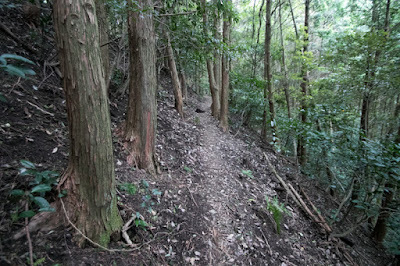 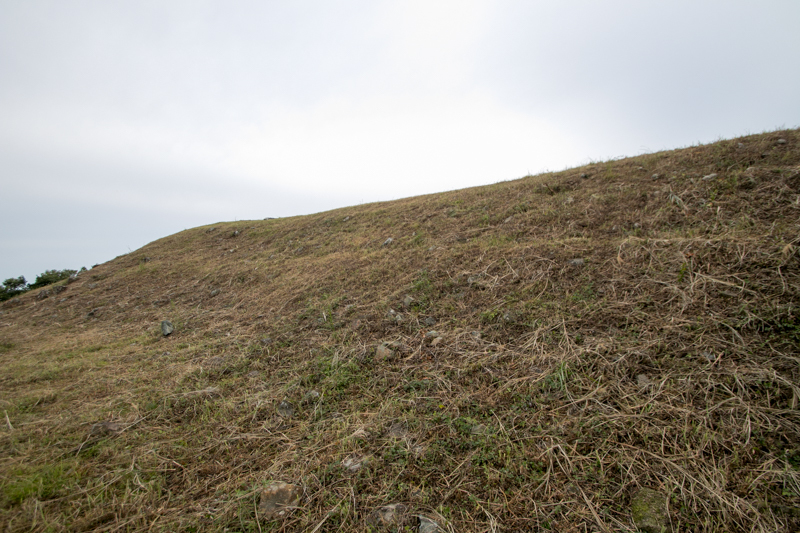 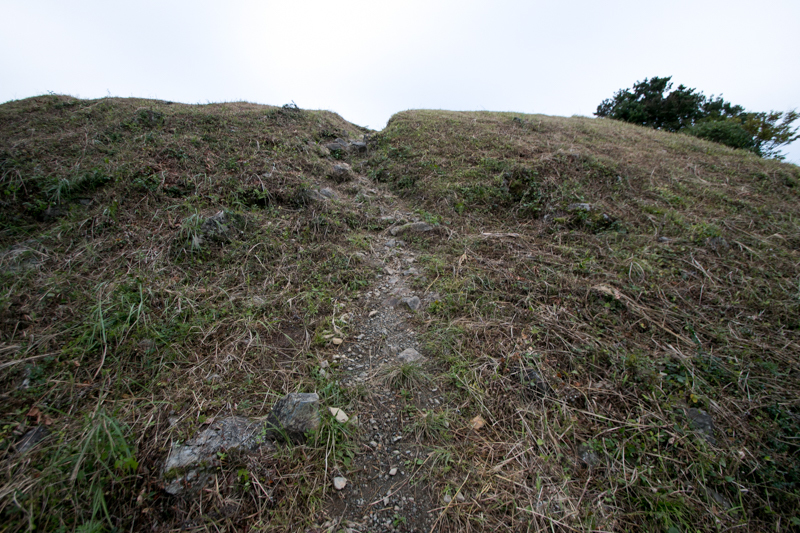 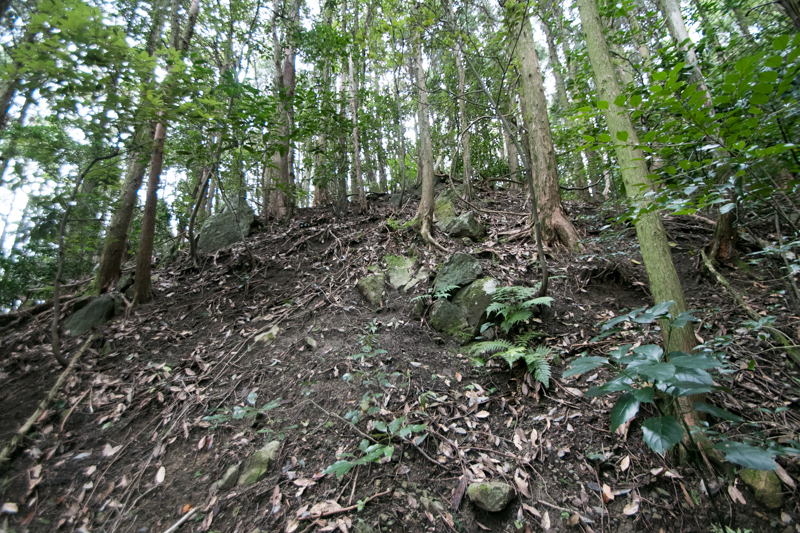 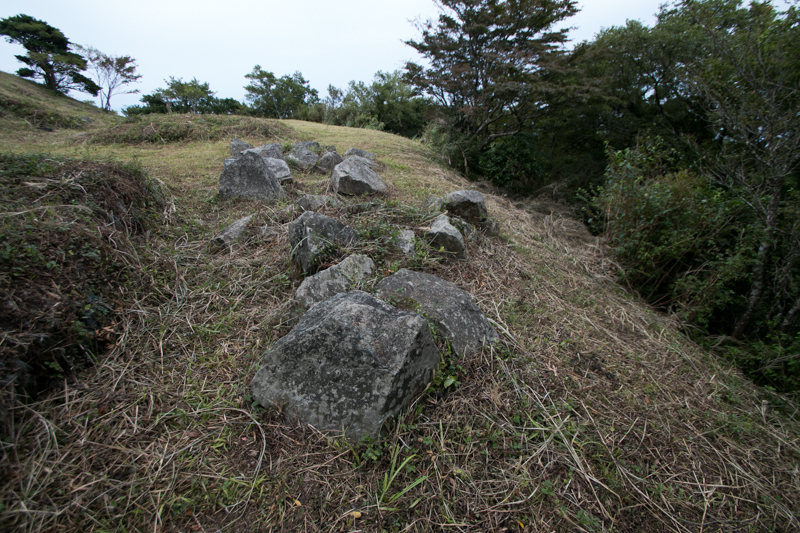 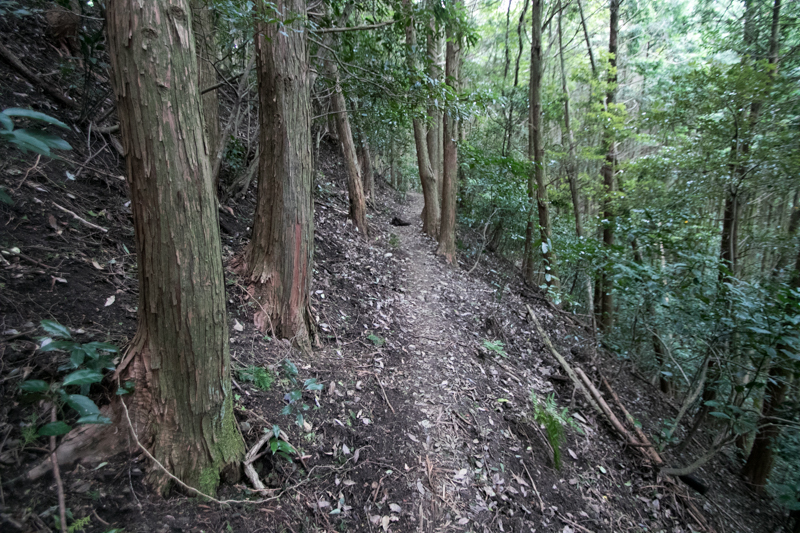 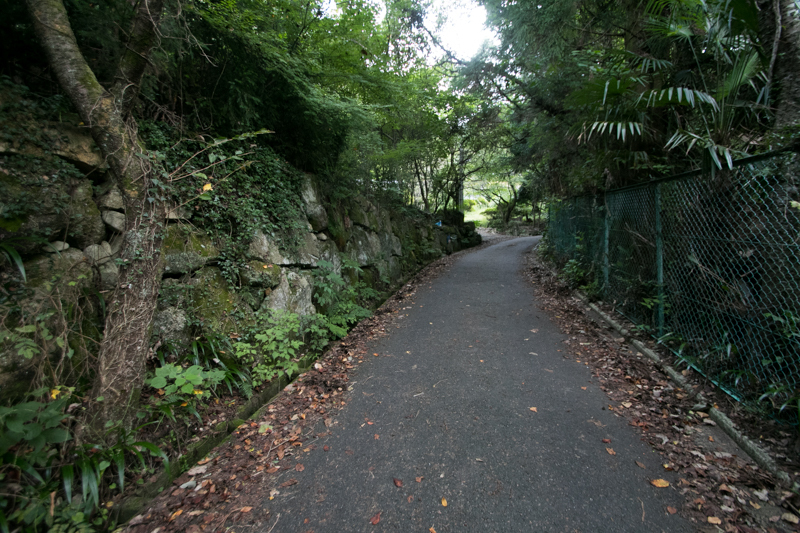 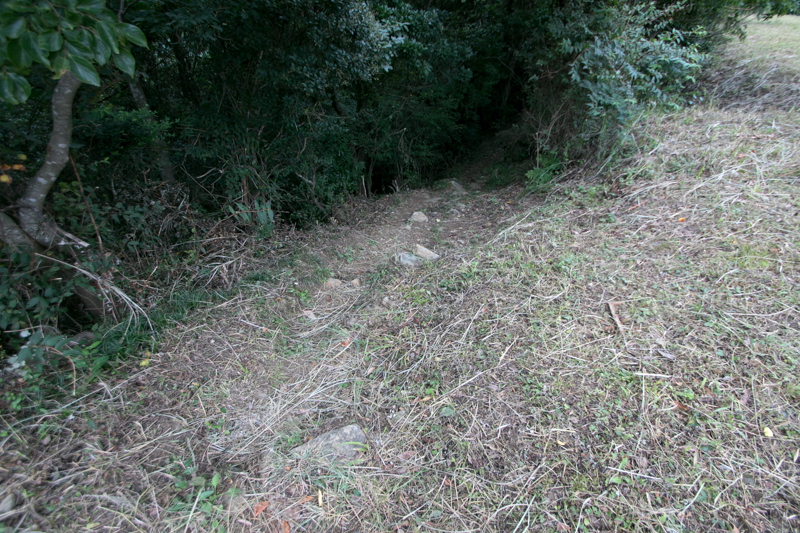 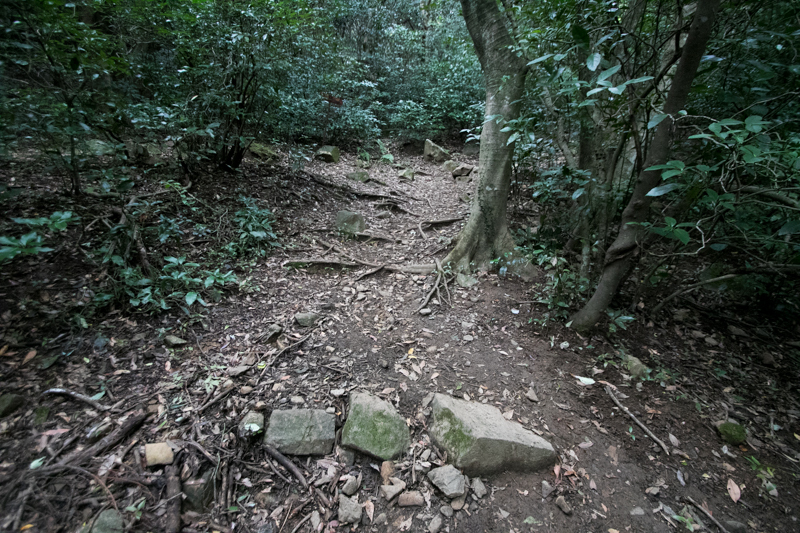 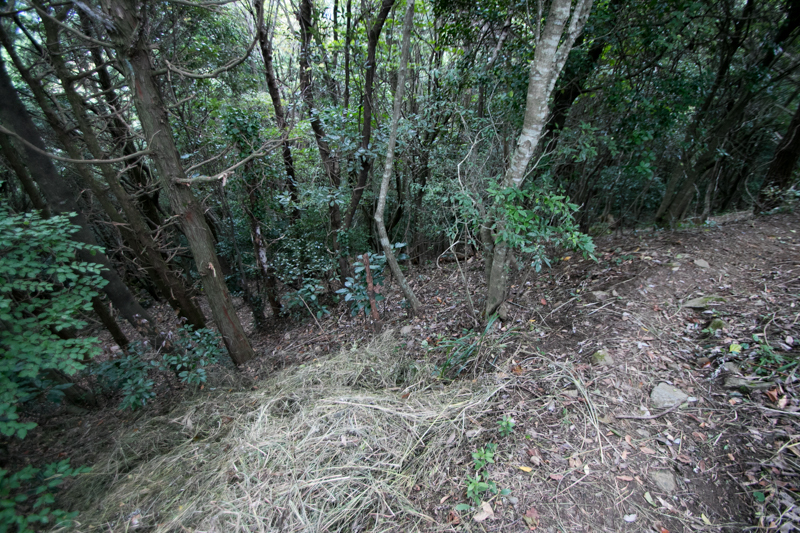 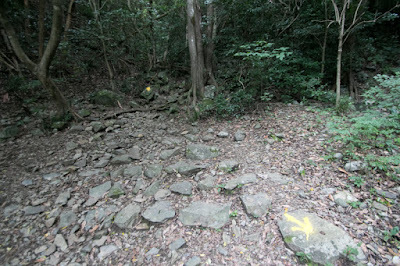 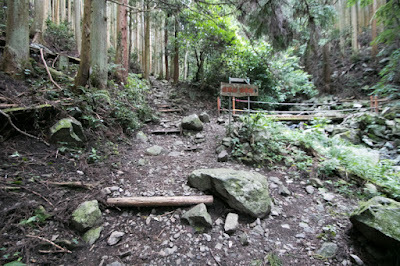 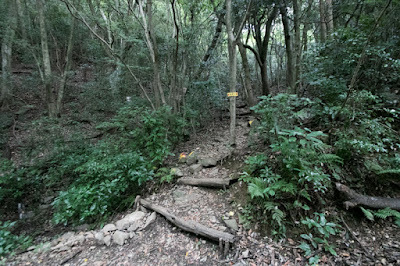 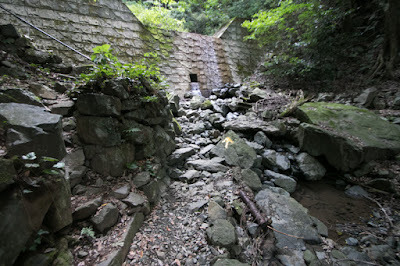 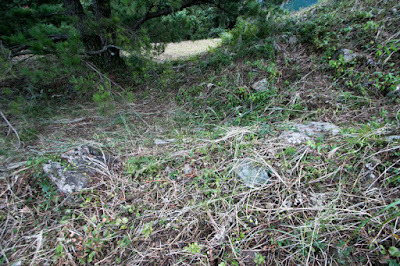 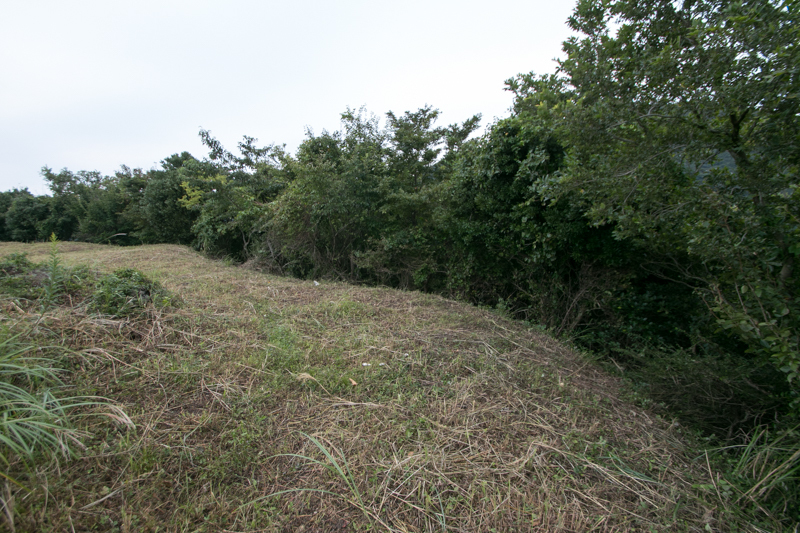 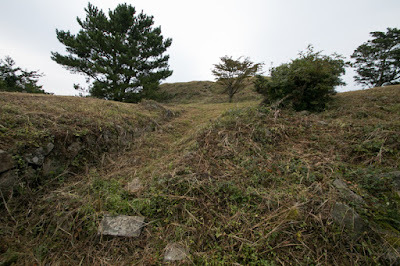 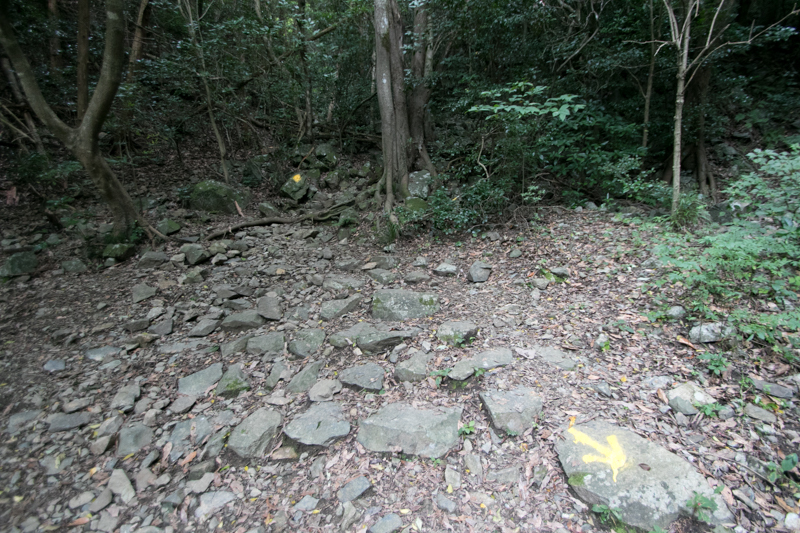 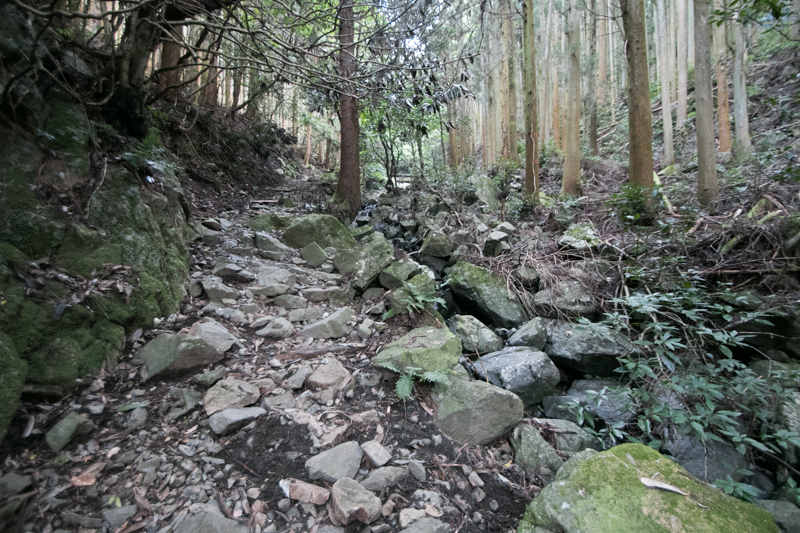 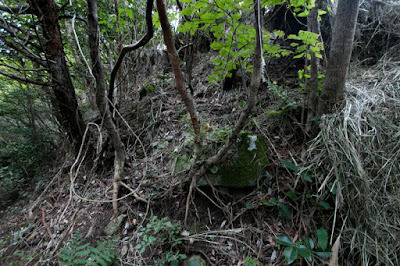 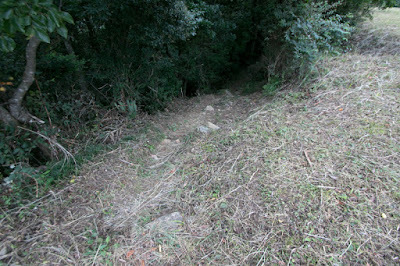 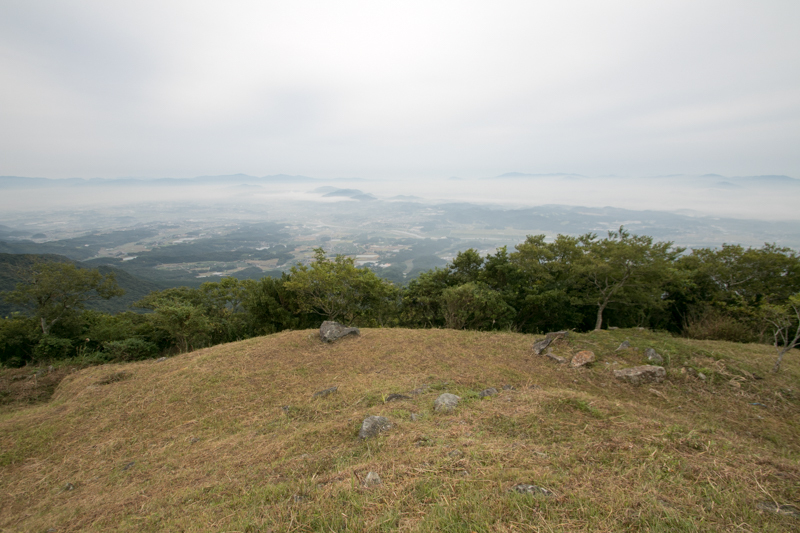 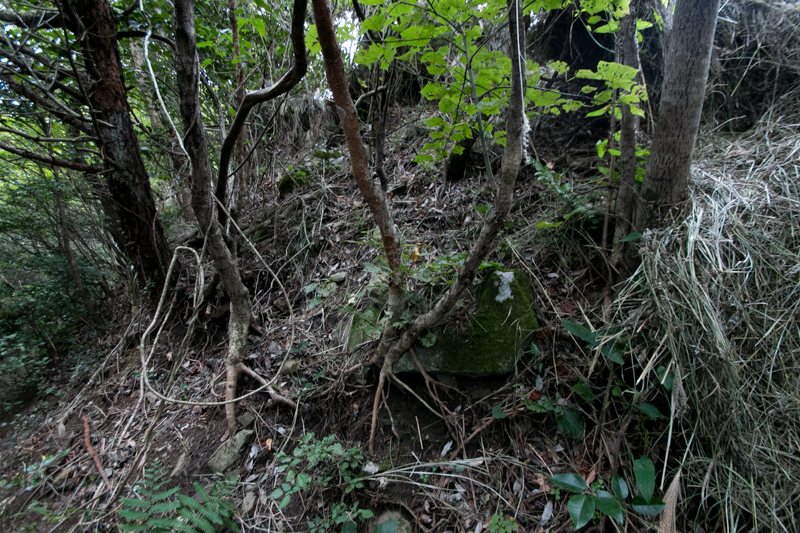 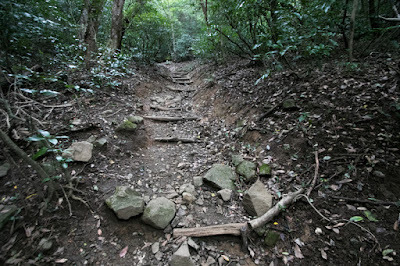 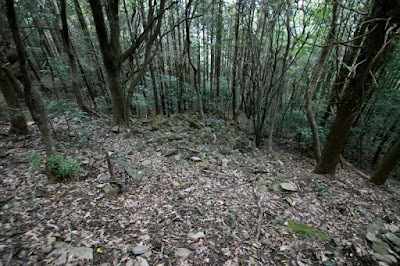 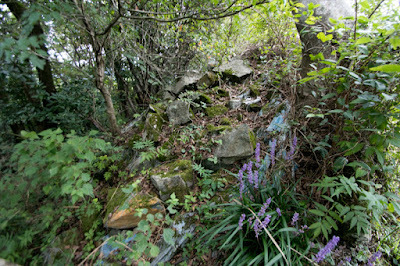 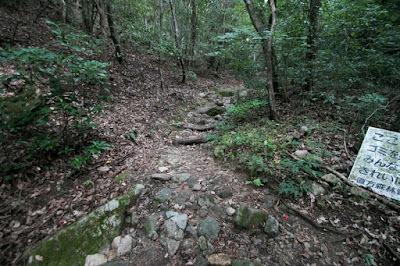 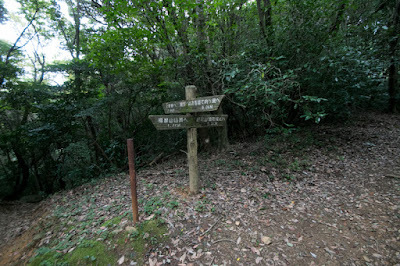 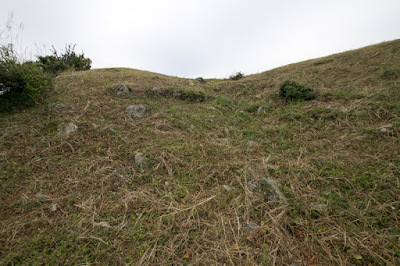 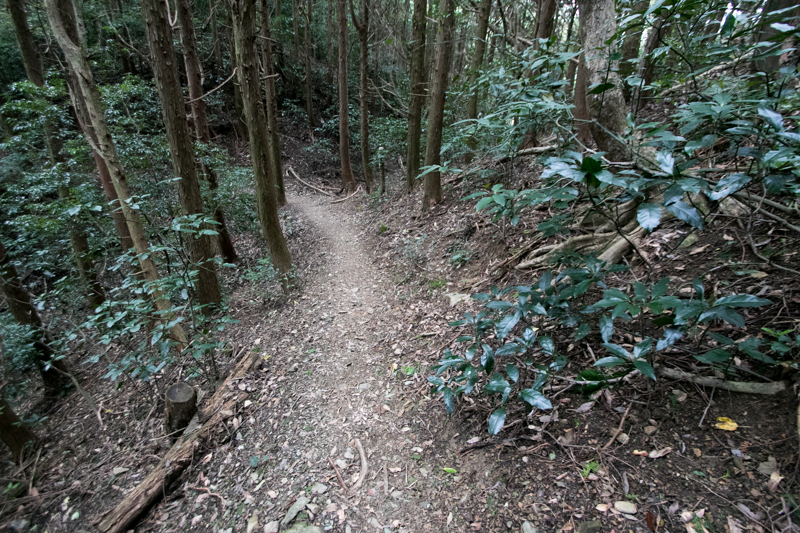 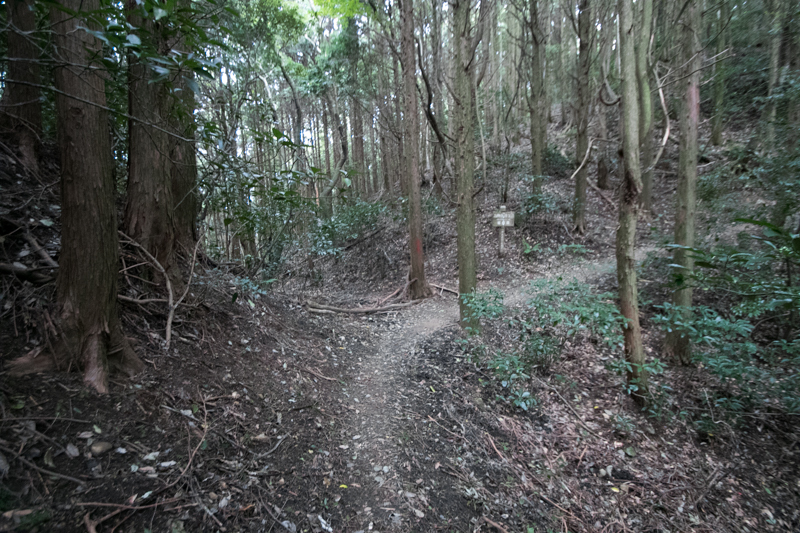 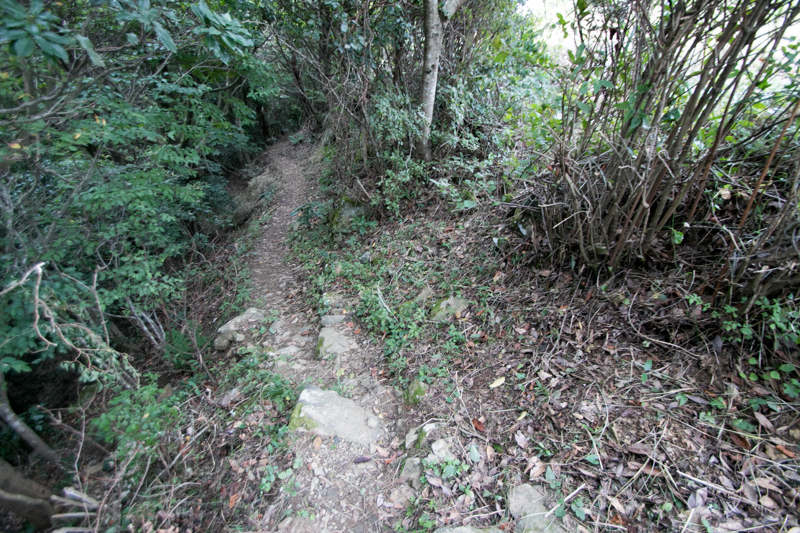 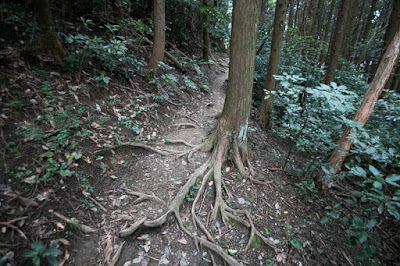 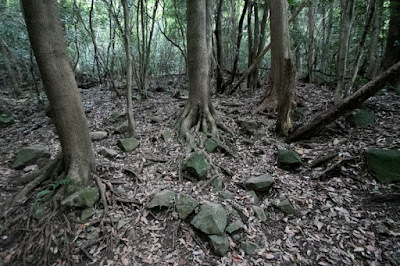 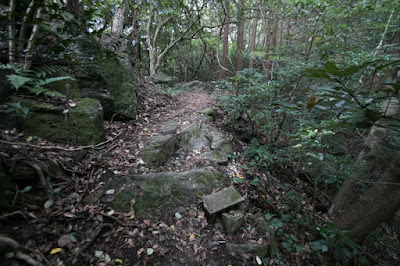 one of about 600 meter height from hillside at 20 kilometer southwest from current Kita-Kyushu city central. 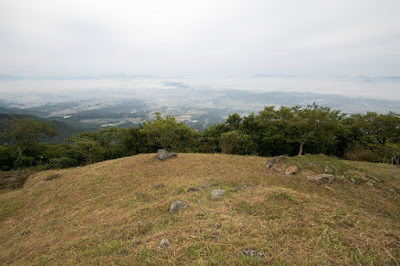 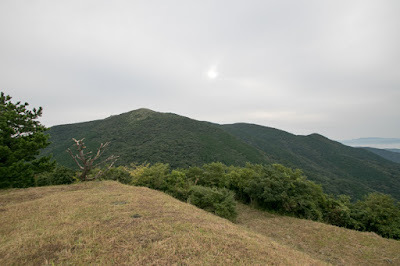 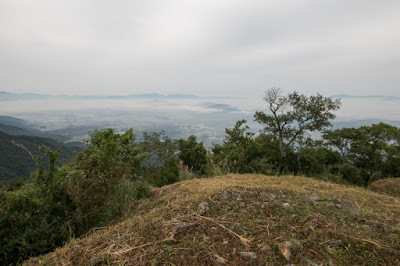 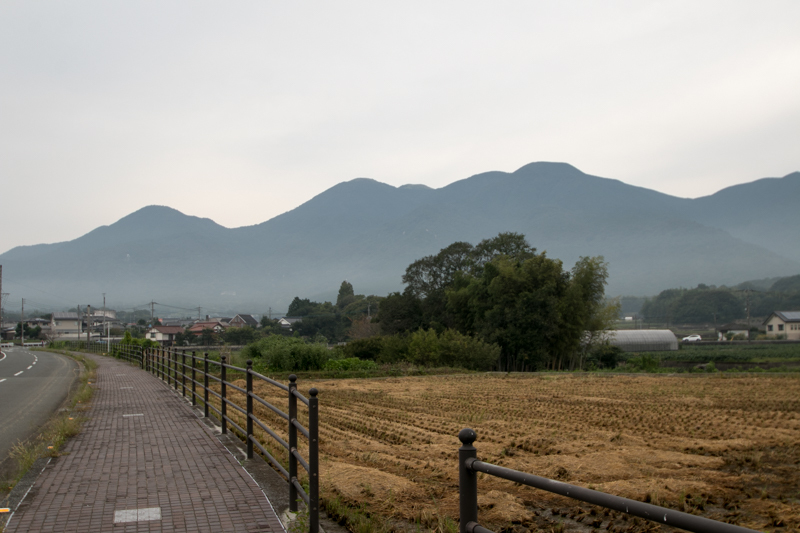 Takatori-yama mountain is a branch peak of Fukuchi-yama mountain, the highest peak of Fukuchi mountains which prolongs 20 kilometer from coastal area of Kita-Kyushu city to Tagawa city, the inland center of Chikuho area. Fukuchi mountains has been worked as the border of Buzen province (eastern part of Fukuoka prefecture) and Chikuzen province (western part of Fukuoka prefecture) for long time. Utilizing sheer slopes faces flat area, many brilliant castles such as Hanao castle, Hobashira-yama castle, Kawaradake castle and Shojigatake castle. 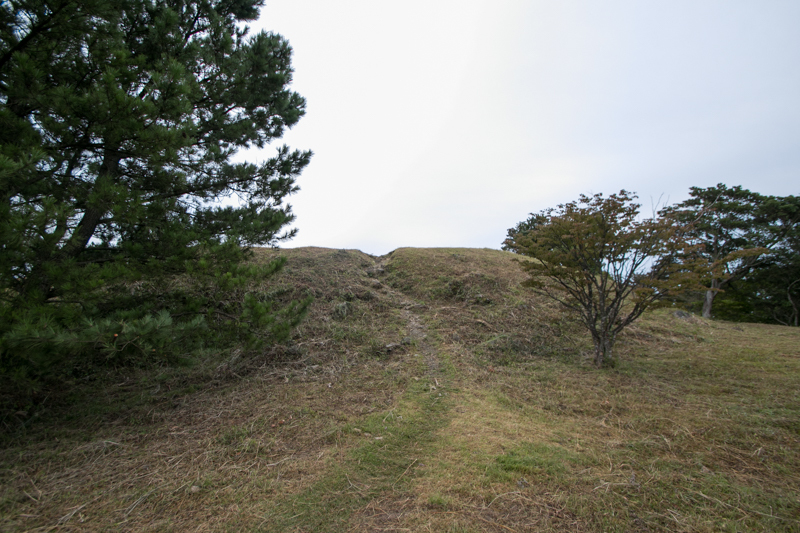 Among these castles, Takatoriyama castle was most advanced one and remained to the last. 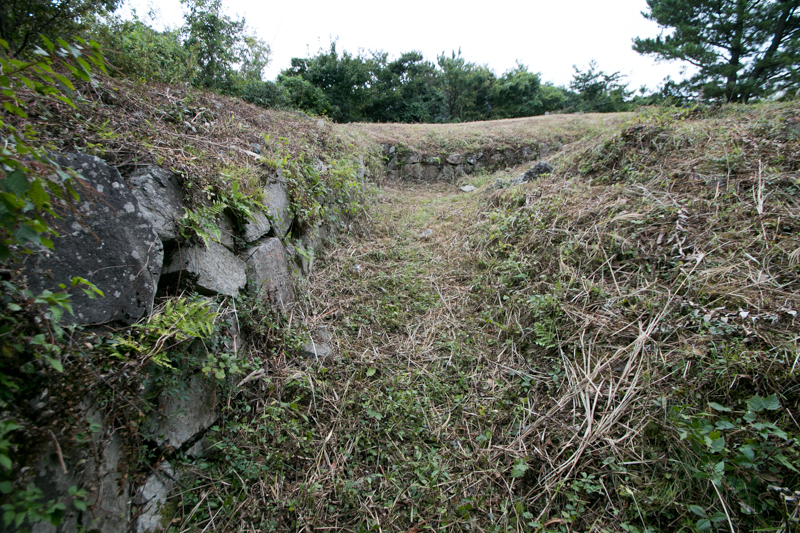 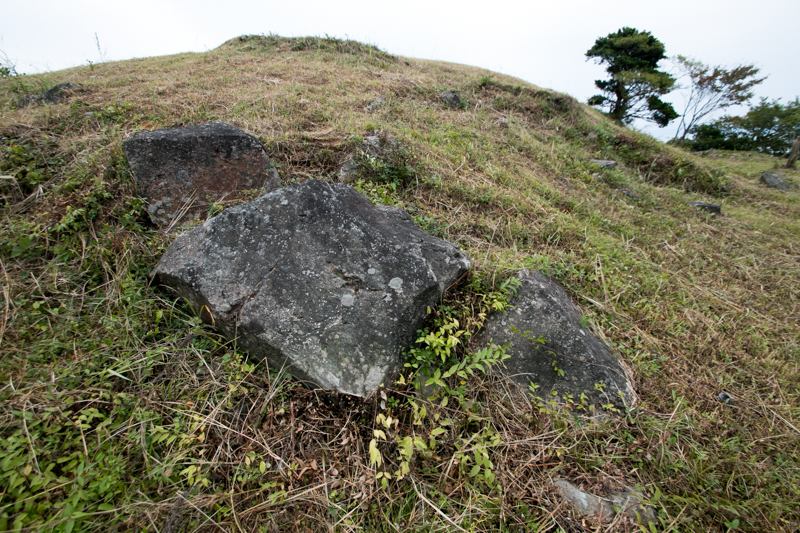 The origin of Takatoriyama castle is unknown but is said that a small fort was originally built in 11th century. Later Shoni clan which was the high class lord of Muromachi era restored the castle, but along with the decline of Shoni clan the lord of Takatoriyama castle changed to local lord Mouri clan. 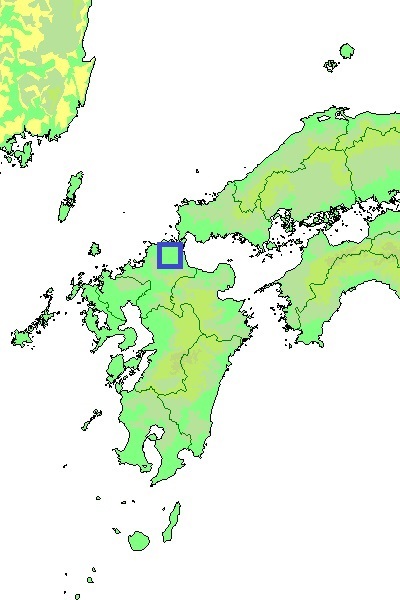 Mouri clan at first turned between Ouchi clan, the strong warlord of Suo province and Nagato province (Yamaguchi prefecture), and Otomo clan which was another strong warlord of Bungo province (Oita prefecture). 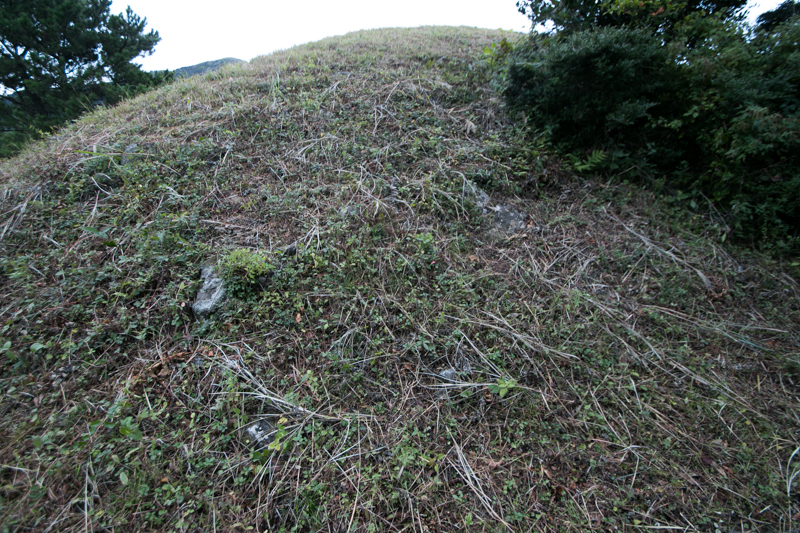 But in 1542, Takatoriyama castle was attacked by strong Otomo army then Mouri clan followed to Otomo clan. 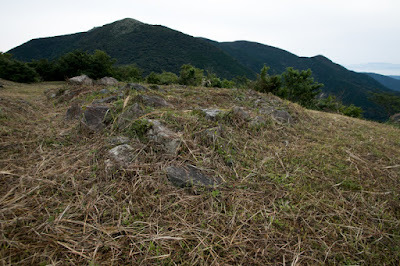 At that time Shigezane Mouri (?-? ), the leader of Mouri clan, fought against neighbor local lords such as Akizuki clan or Aso clan which did not follow to Otomo clan. 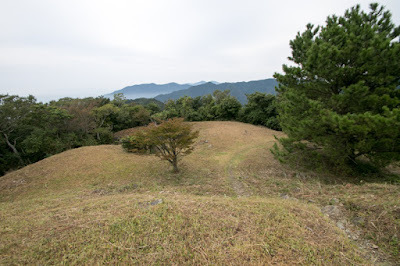 Shigezane Mouri also recorded as a messenger from Otomo clan to buy back Honebami Sword, a brilliant sword once donated from Otomo clan to Muromachi Shogunate but was deprived by Matsunaga clan. But facing the decline of Otomo clan after the defeat at the battle of Mimikawa in 1578, Shigezane Mouri turned to Akizuki clan, the local lord of Koshosan castle at neighbor place which rapidly grew their power. 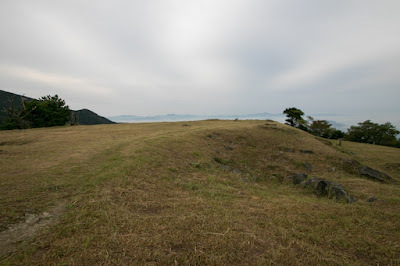 However, facing the expedition of central ruler Hideyoshi Toyotomi (1537-1598) Akizuki clan lost their territory, and Takatoriyama castle was once abolished. In 1600, after the battle of Sekigahara, Kuroda clan which was formerly the lord of Buzen province moved to the lord of Chikuzen province, and Hosokawa clan was transferred from Tango province (Kyoto prefecture) to Buzen province. But as Kuroda clan took all crops of Buzen province at the move, thus there arouse tension between both clans. 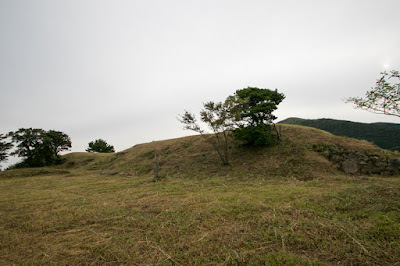 Preparing for Hosokawa clan, Kuroda clan built six branch castles including Wakamatsu castle, Kurosaki castle, Takatoriyama castle, Masutomi castle, Matsuo castle and Matera castle. 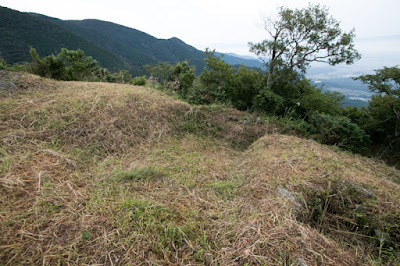 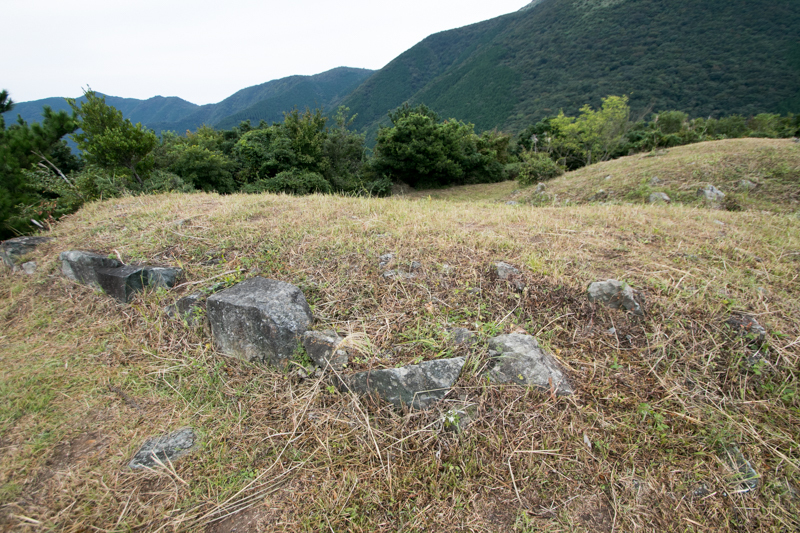 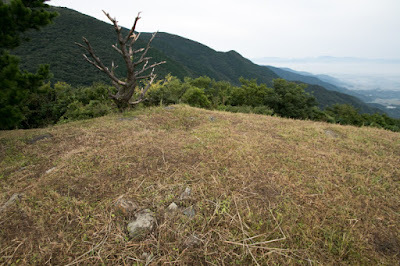 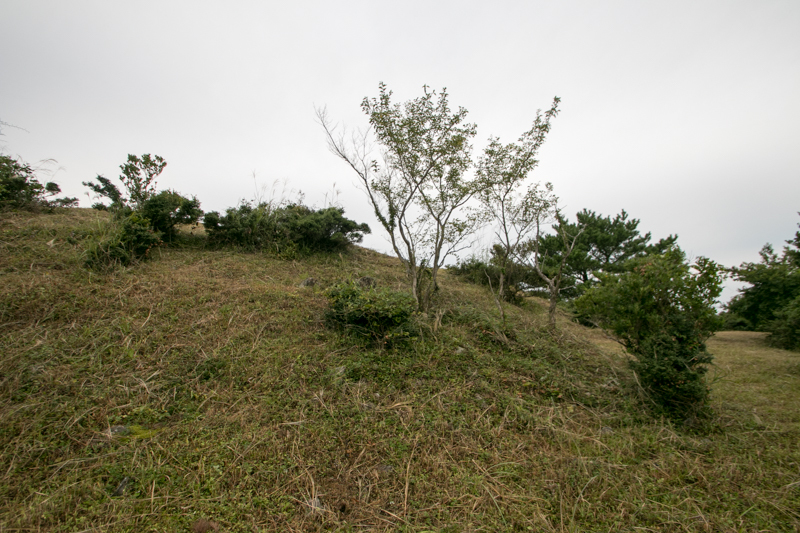 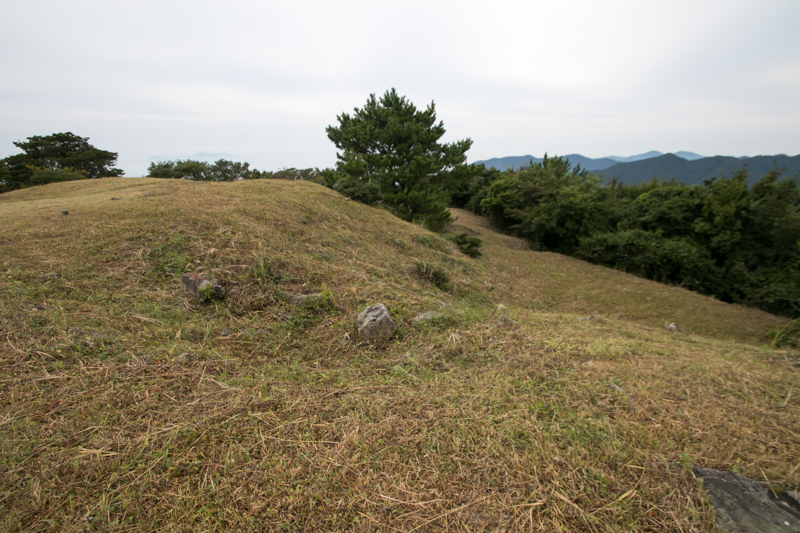 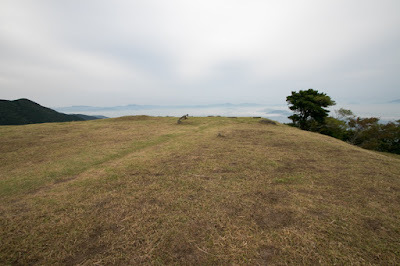 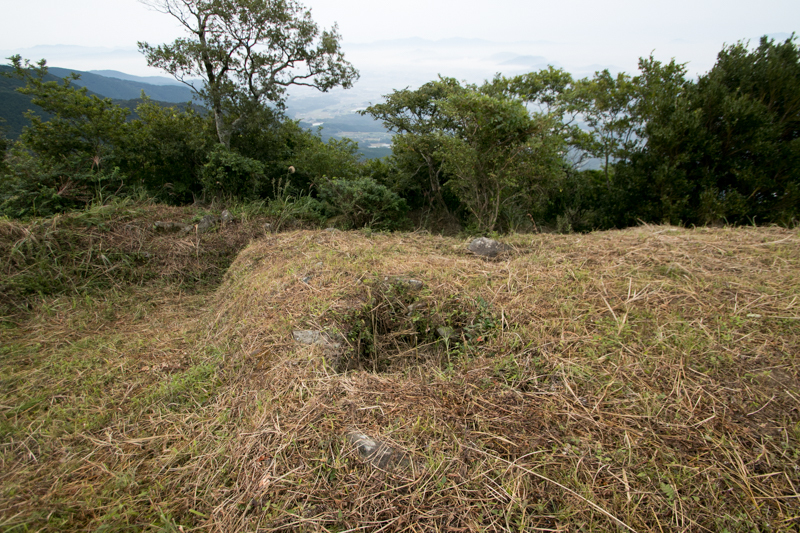 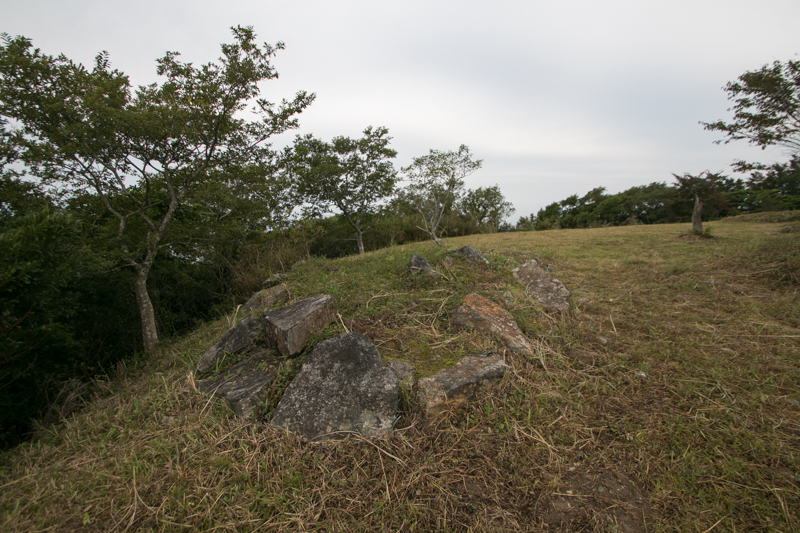 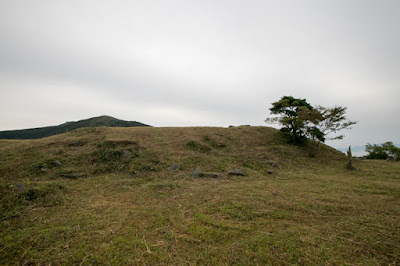 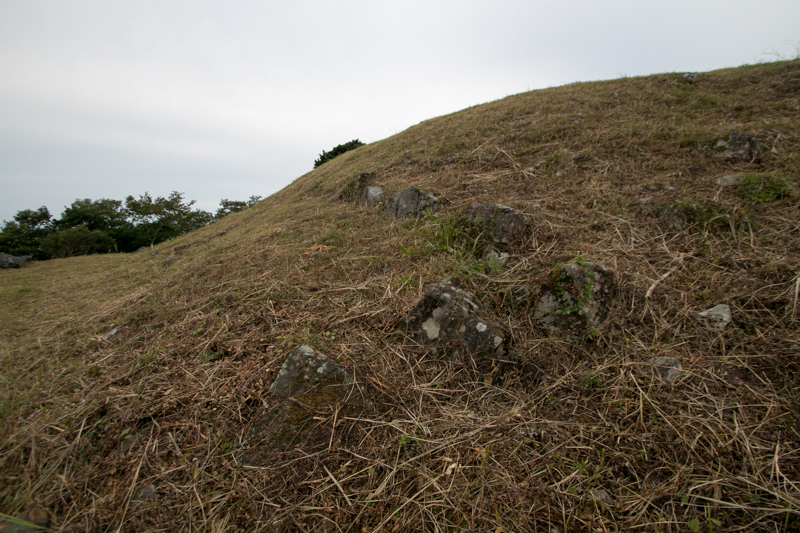 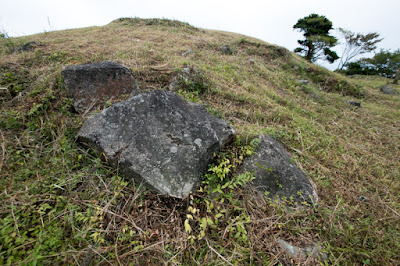 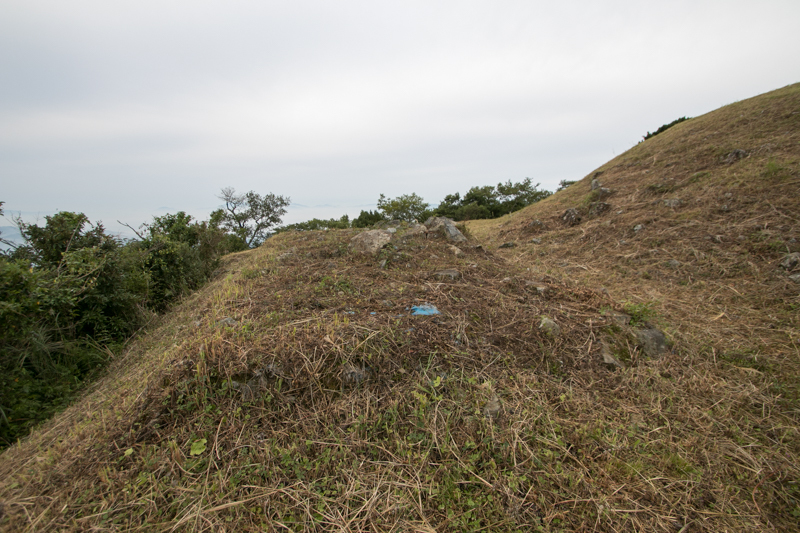 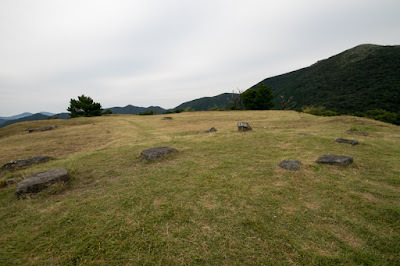 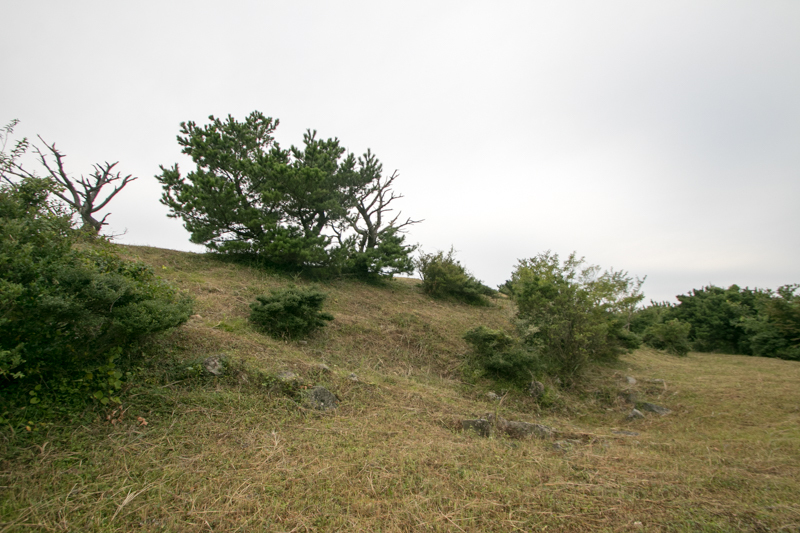 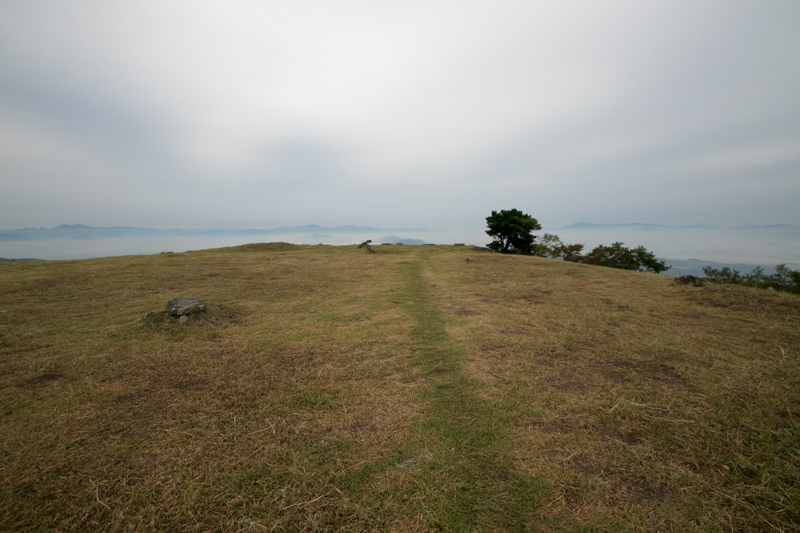 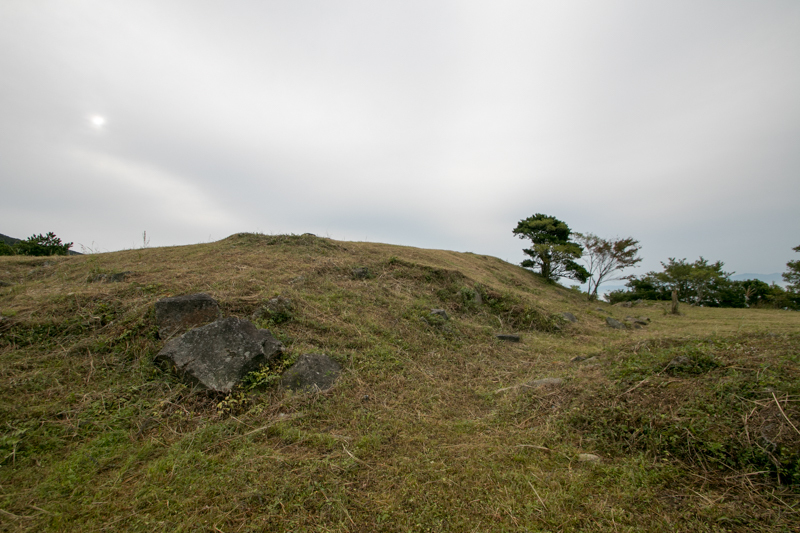 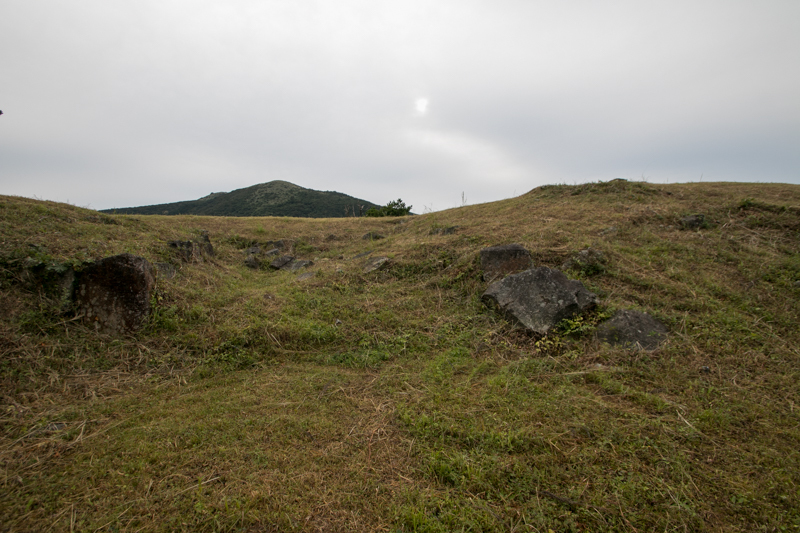 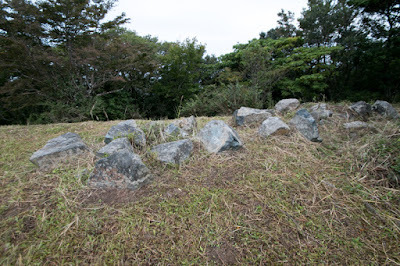 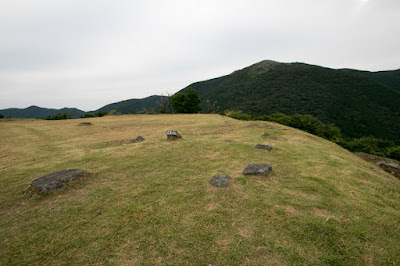 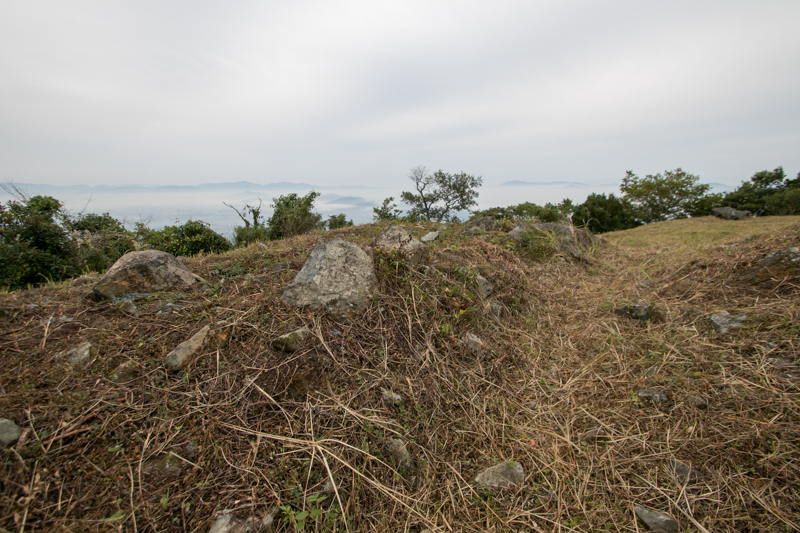 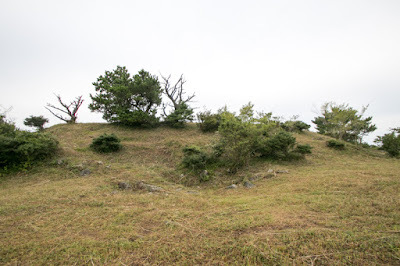 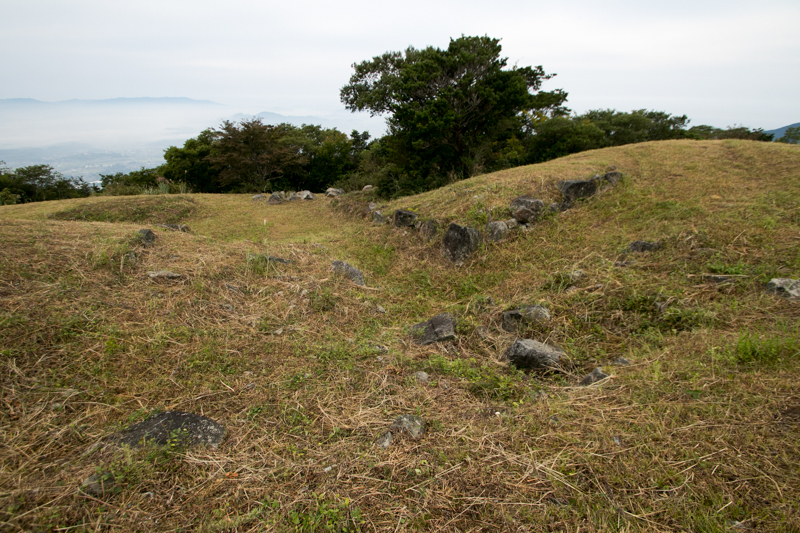 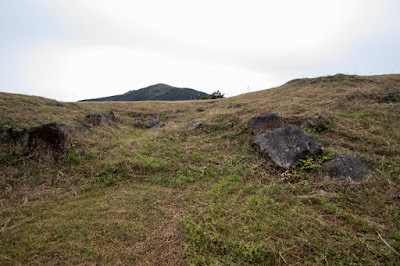 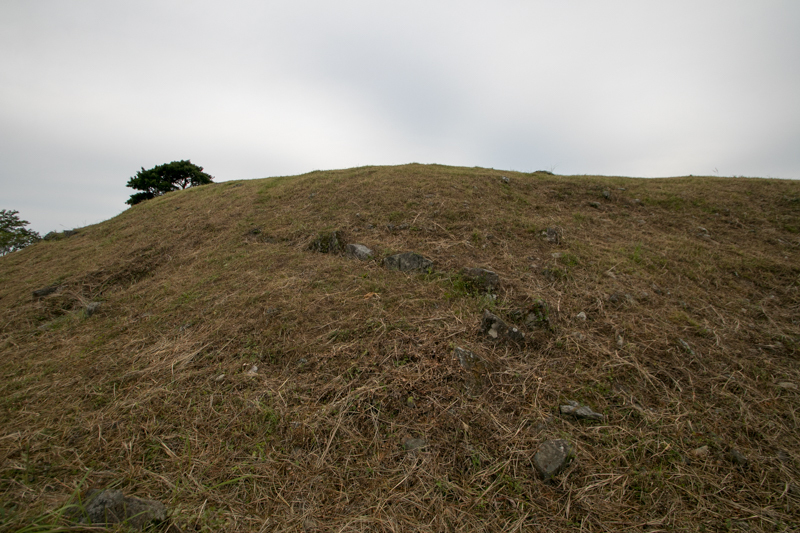 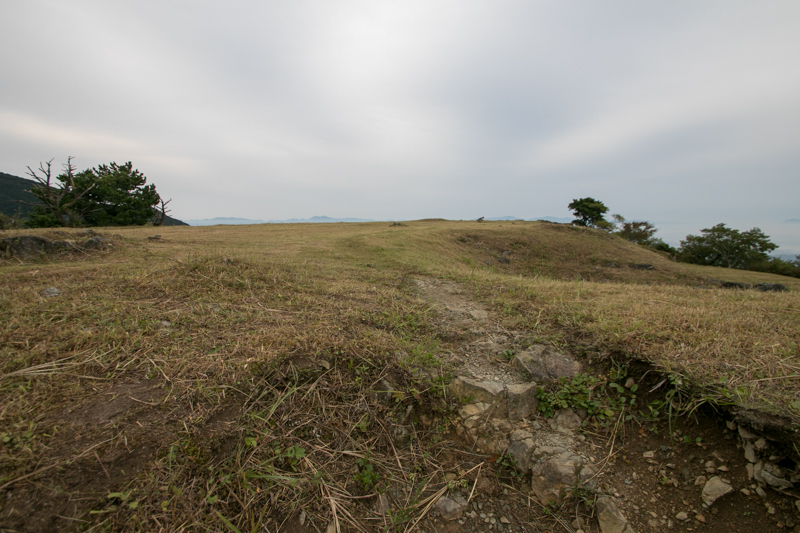 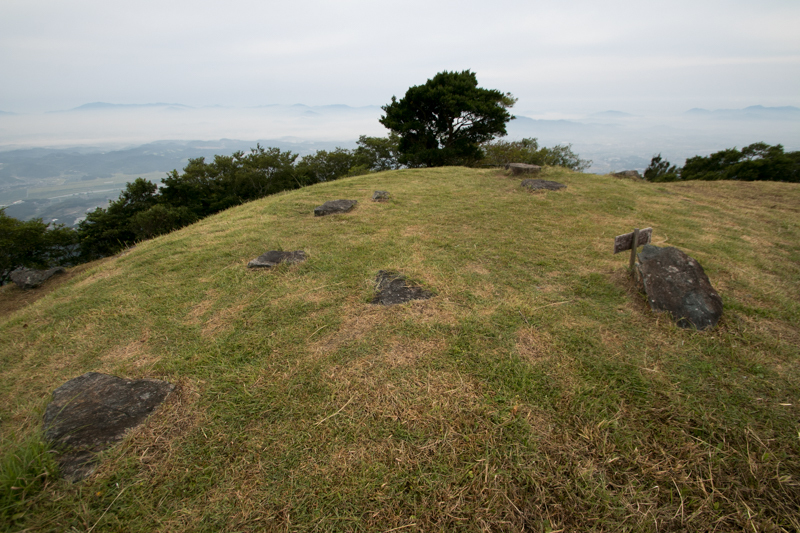 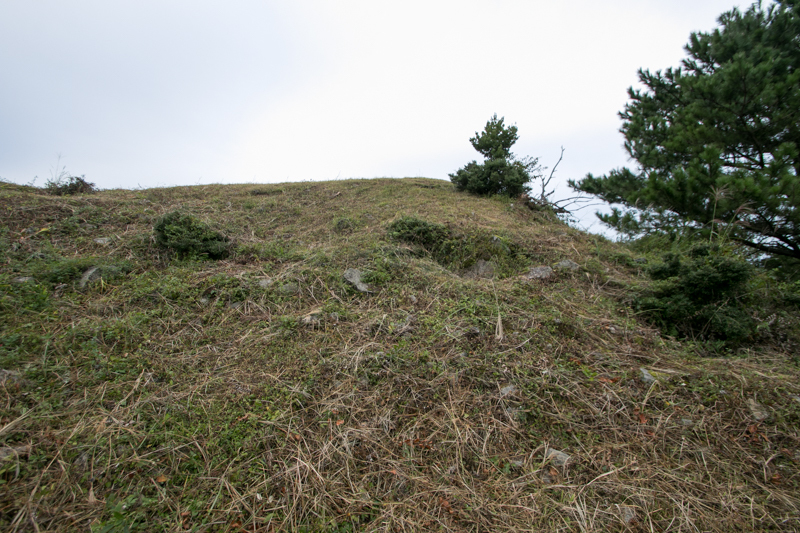 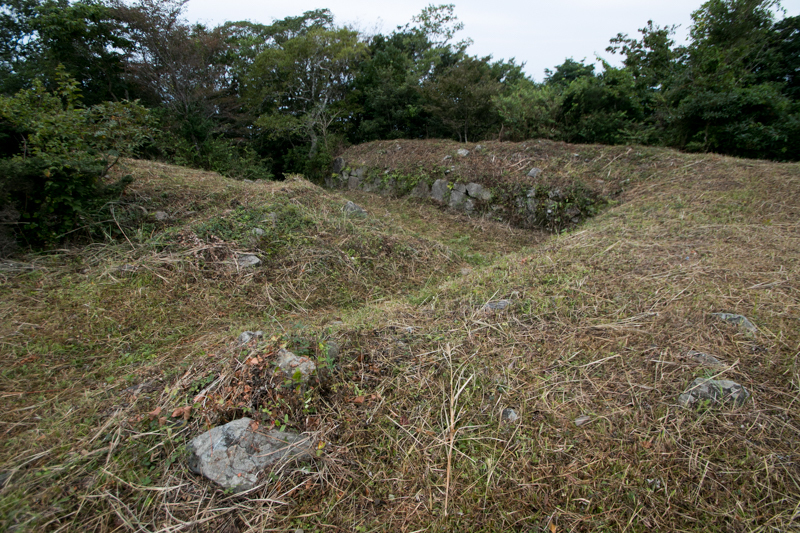 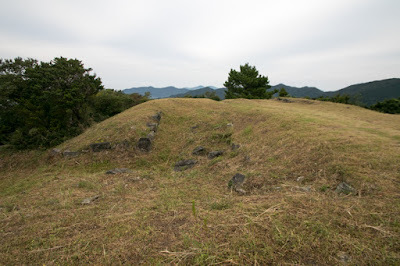 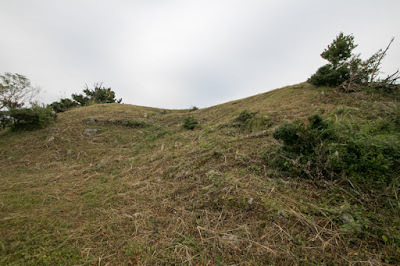 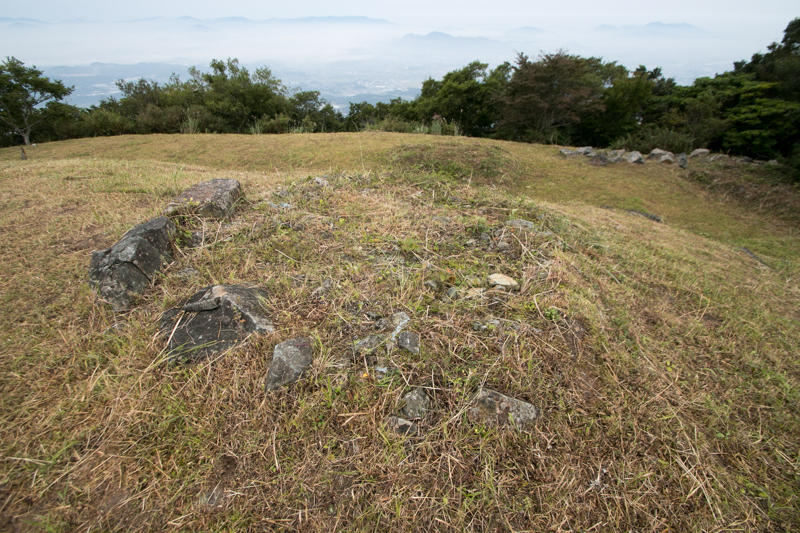 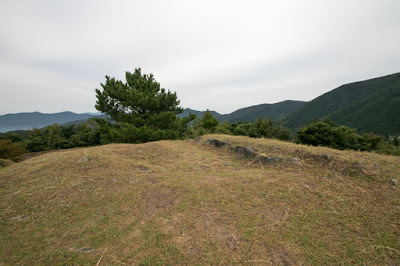 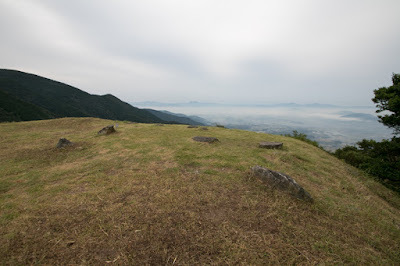 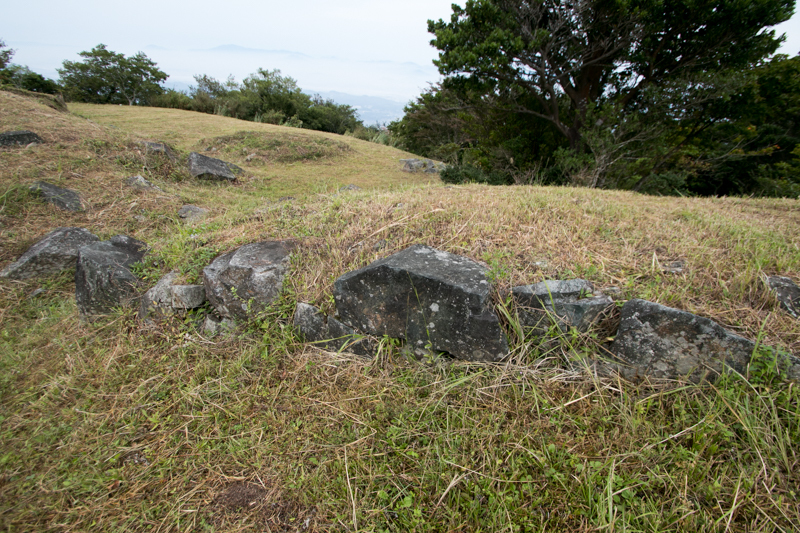 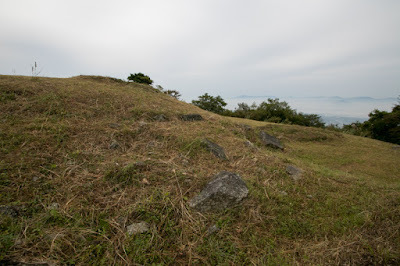 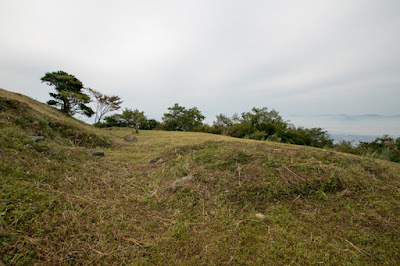 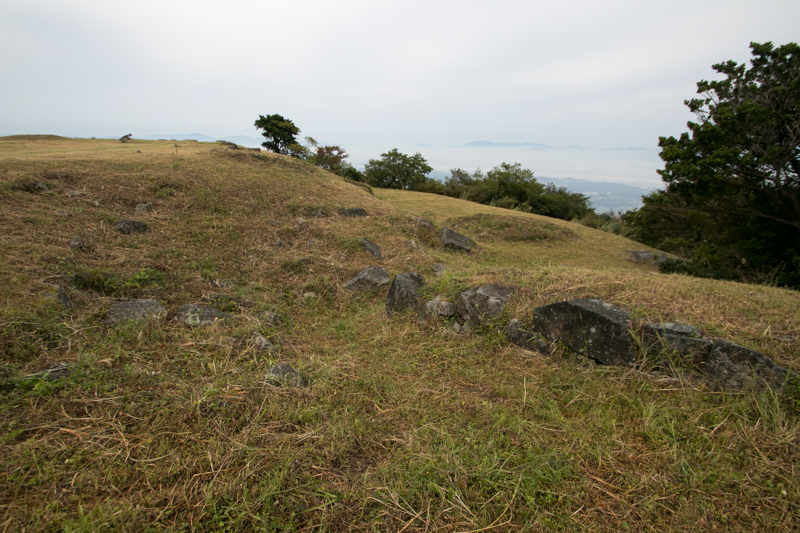 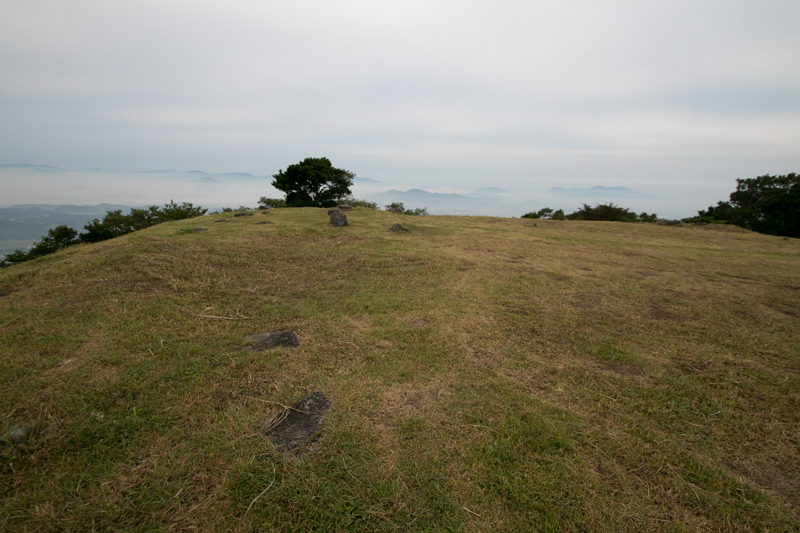 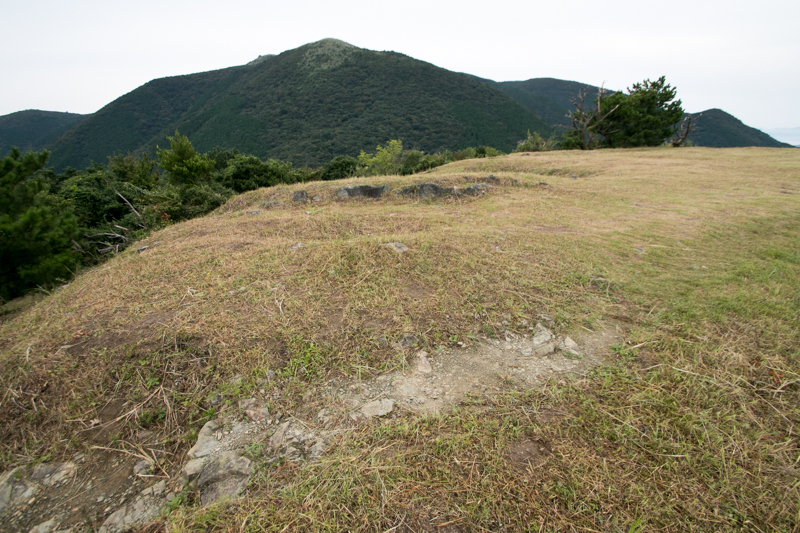 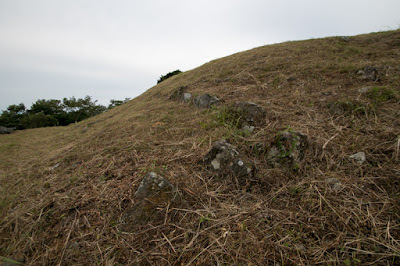 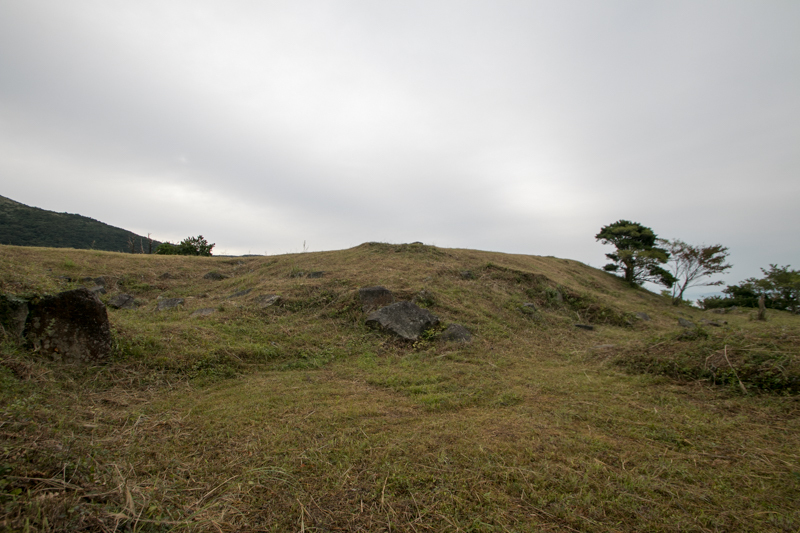 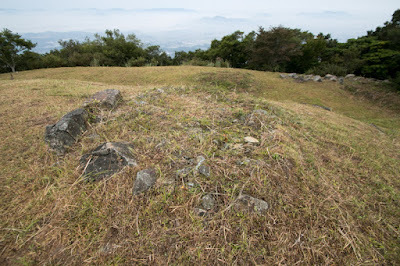 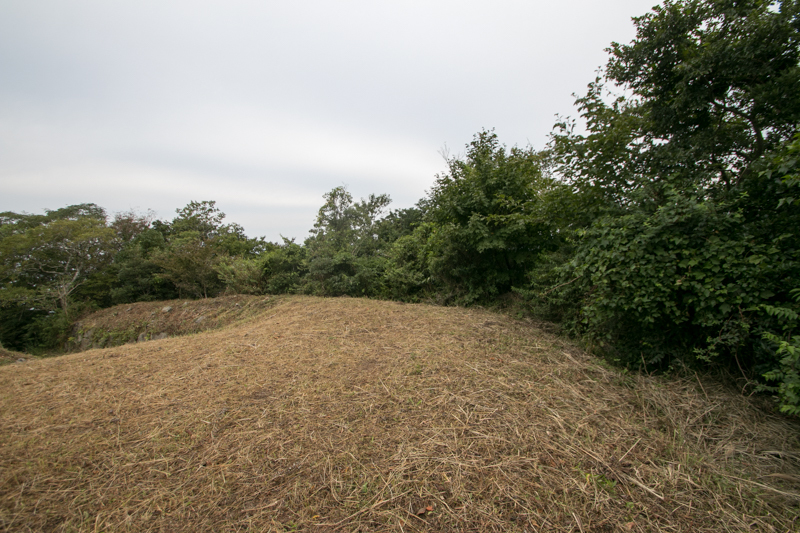 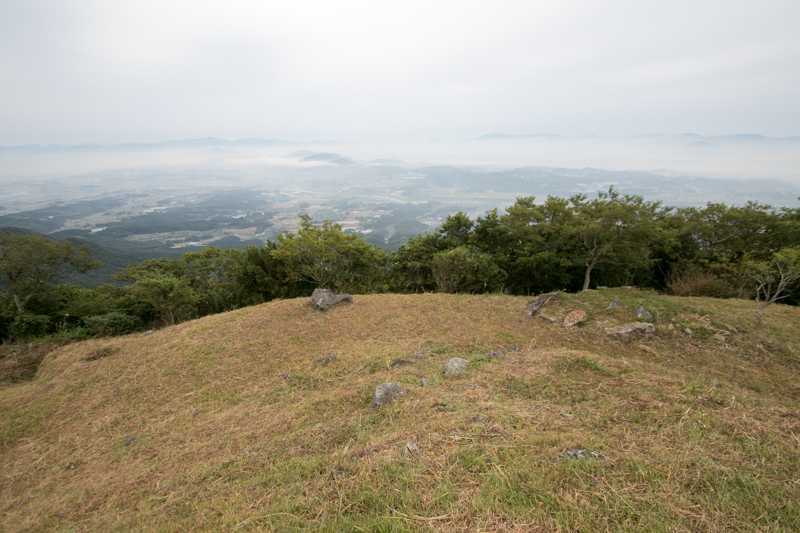 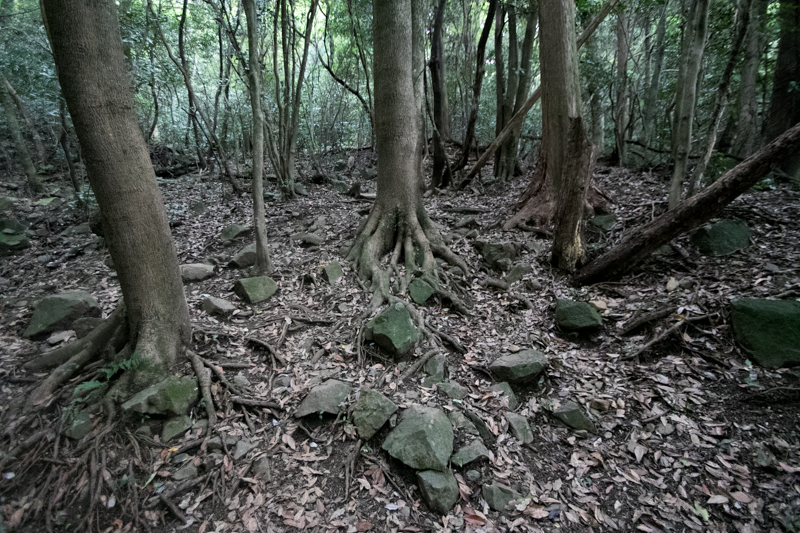 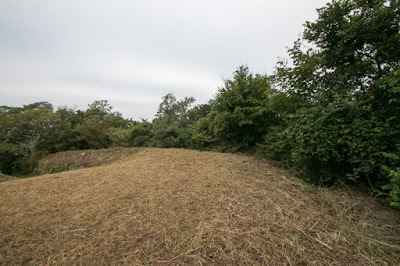 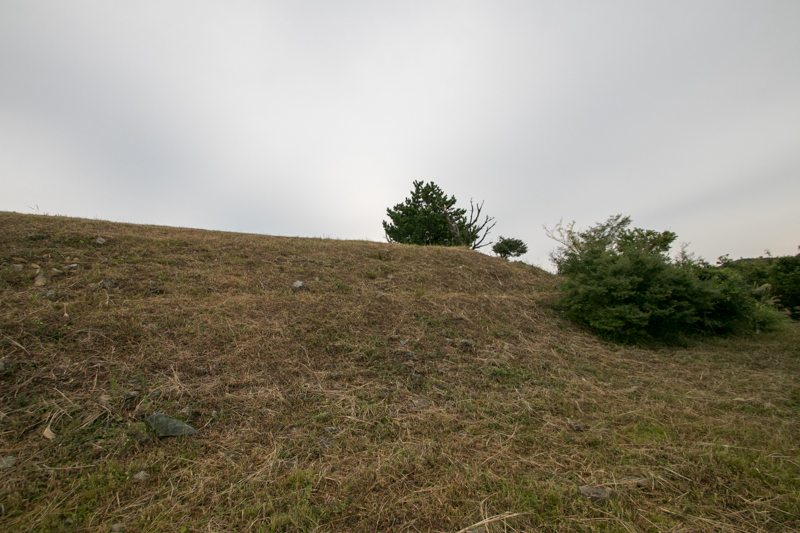 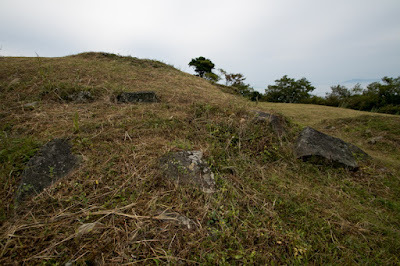 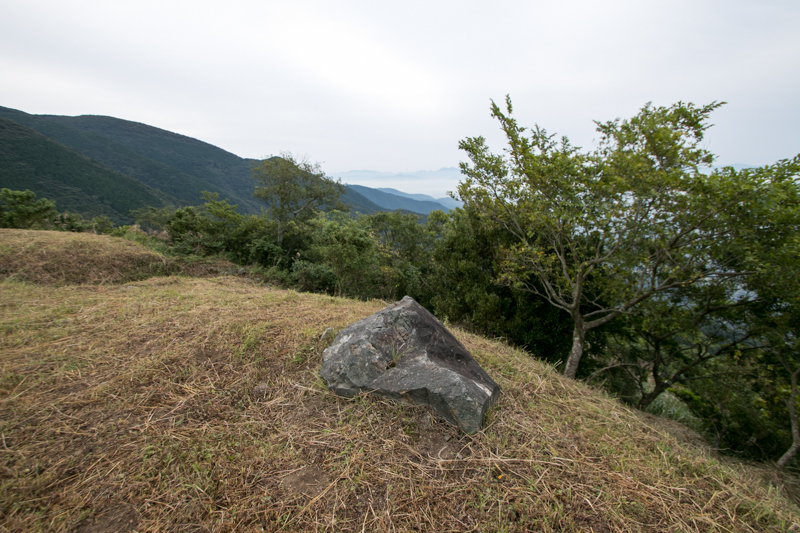 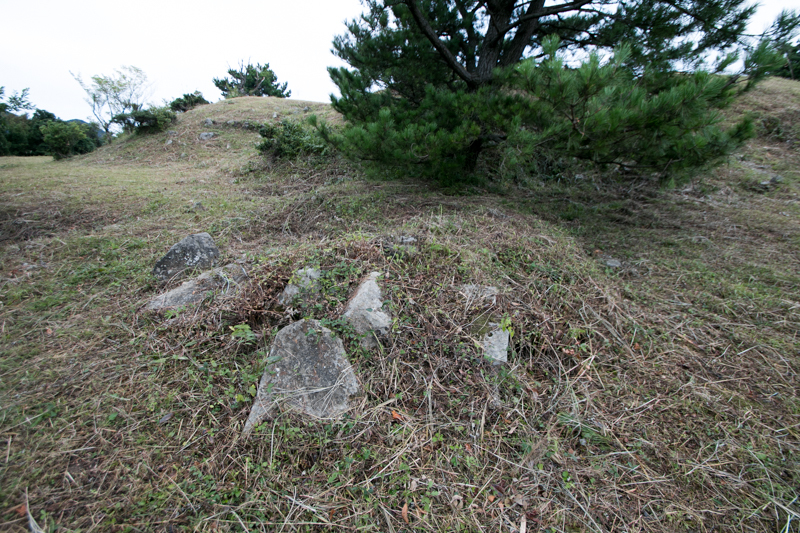 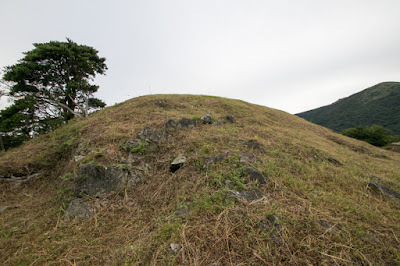 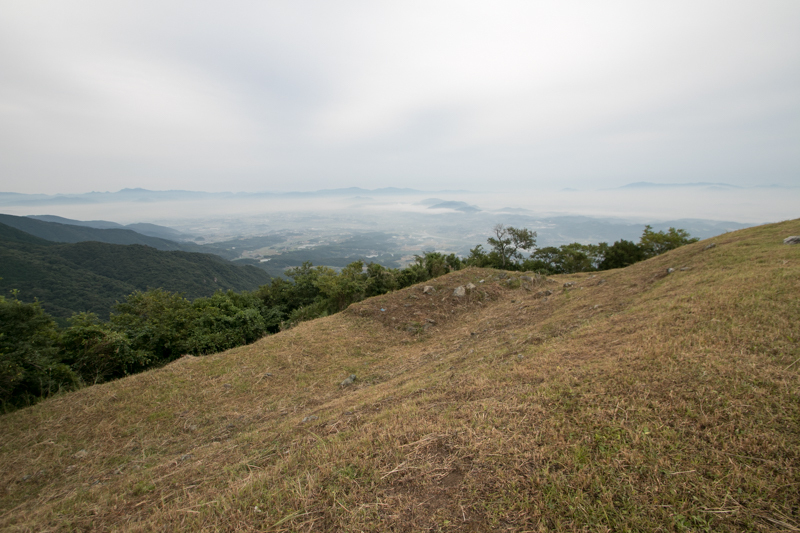 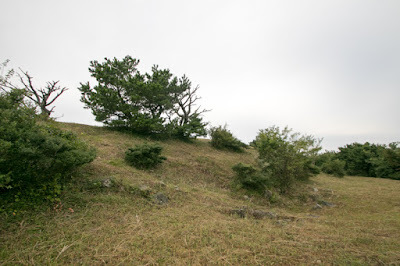 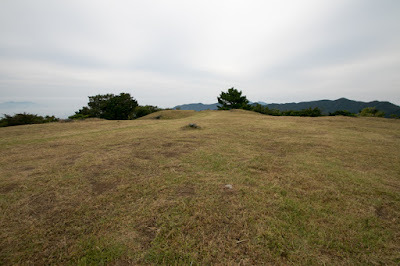 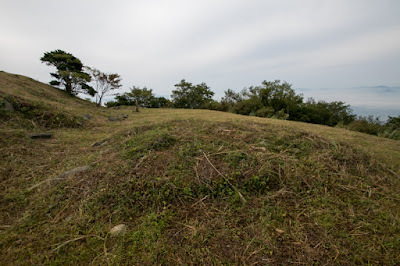 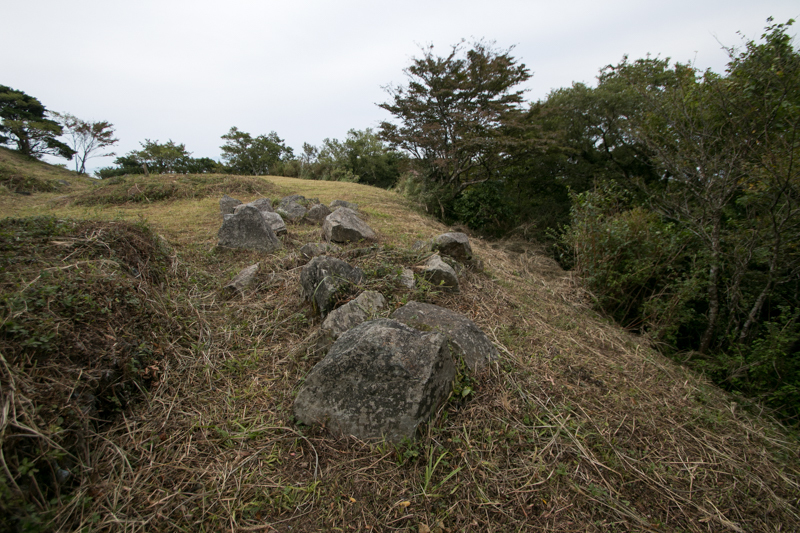 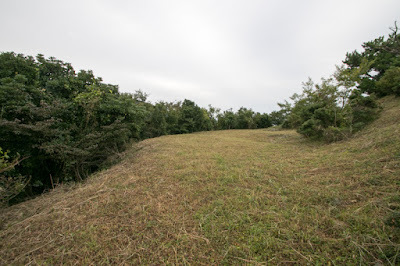 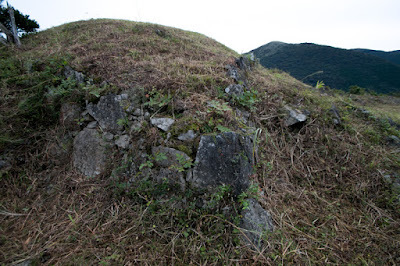 Especially Fukuchi mountains is difficult point to protect without clear passing point, and at the south edge there remained Kawaradake castle which became the front fort of Hosokawa clan. To secure the whole mountains, Kuroda clan restored Takatoriyama castle and renovated into a modern fortress. 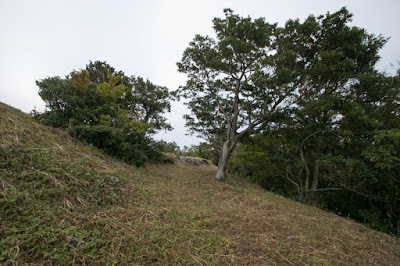 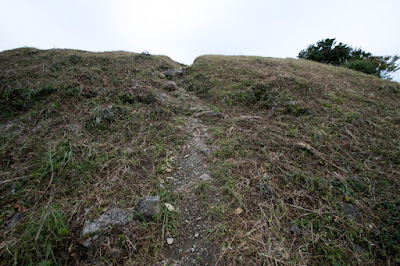 The place of Takatoriyama castle is not convenient and inferior toward Fukuchi-yama mountain which can look down on castle, but it was politically impossible to build the castle directly at the top of critical Fukuchi-yama mountain. 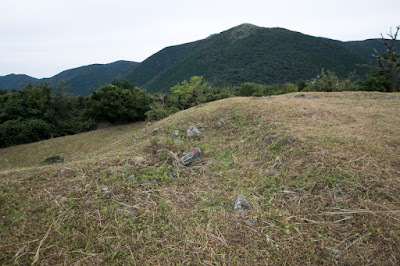 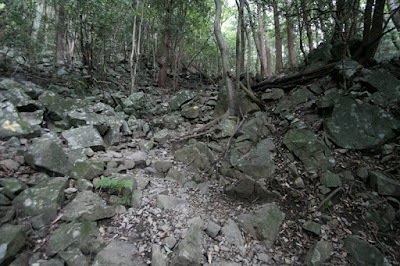 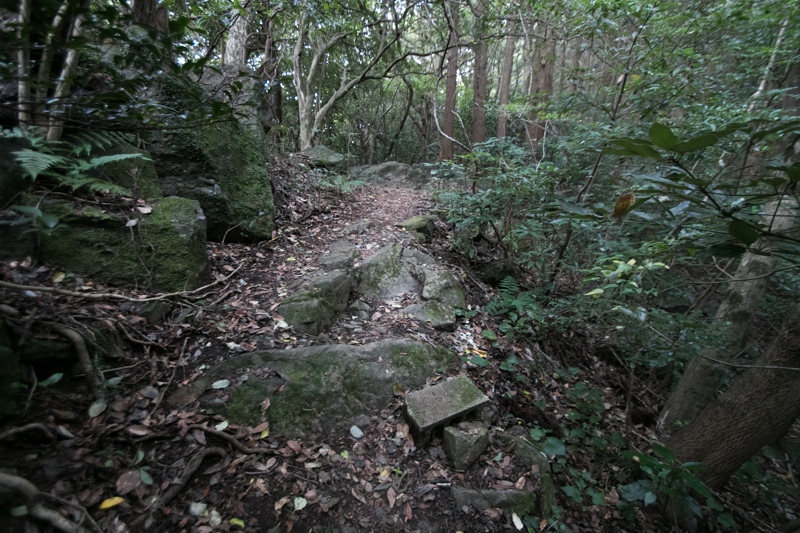 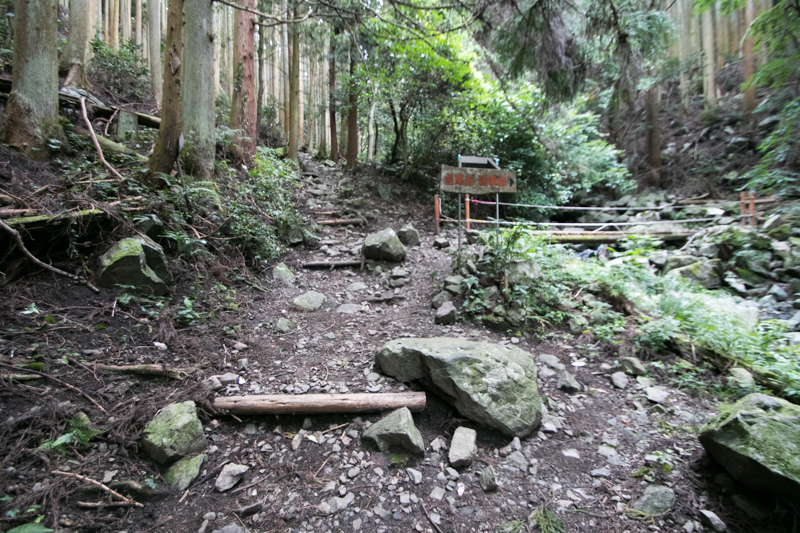 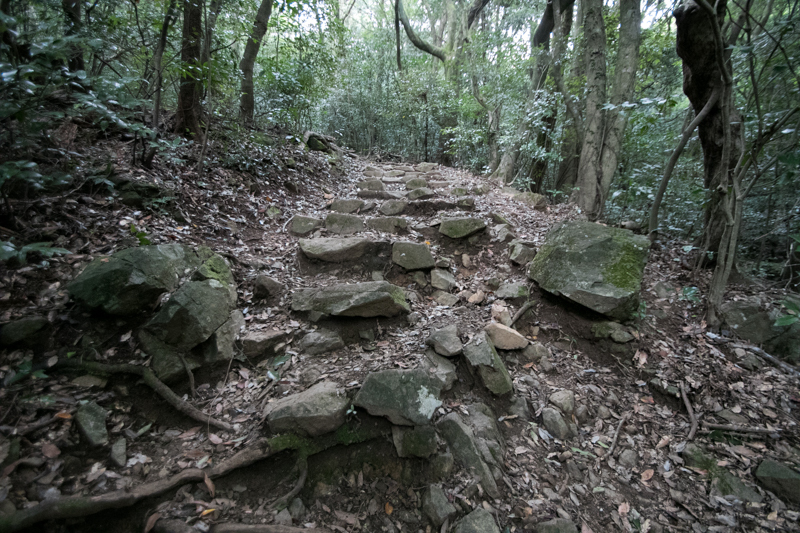 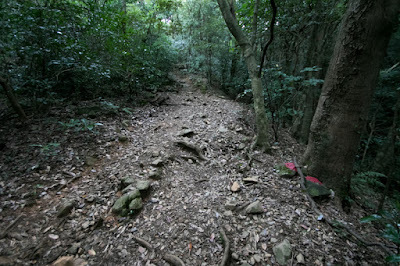 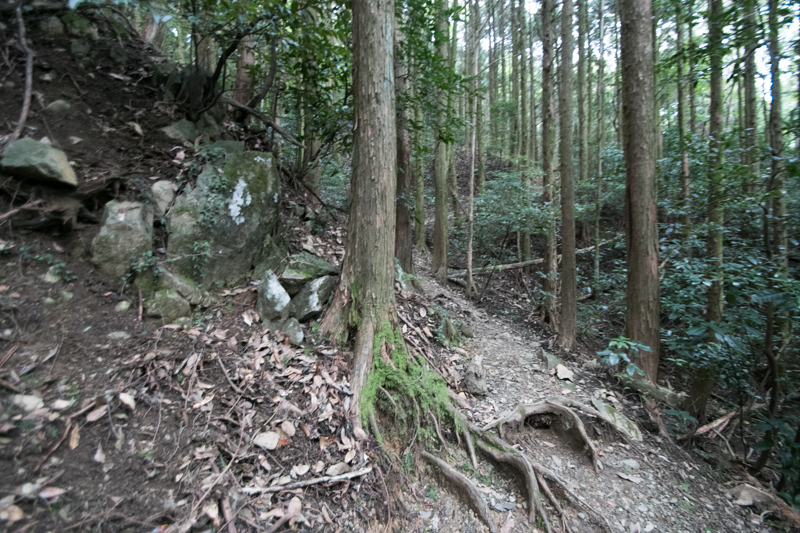 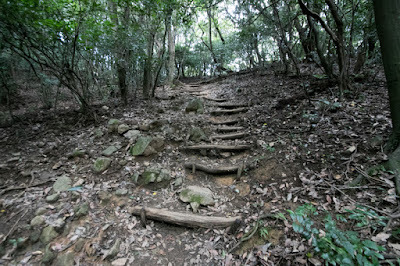 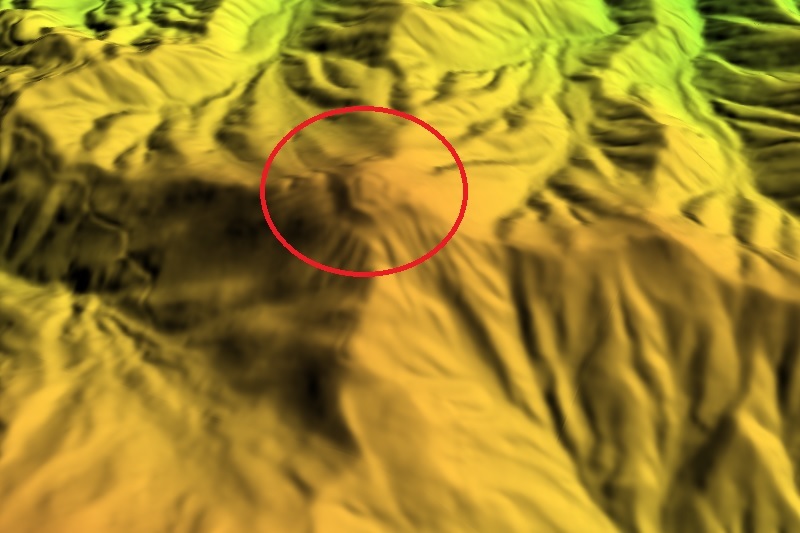 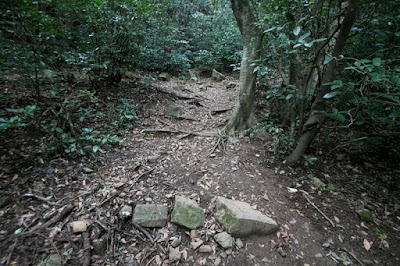 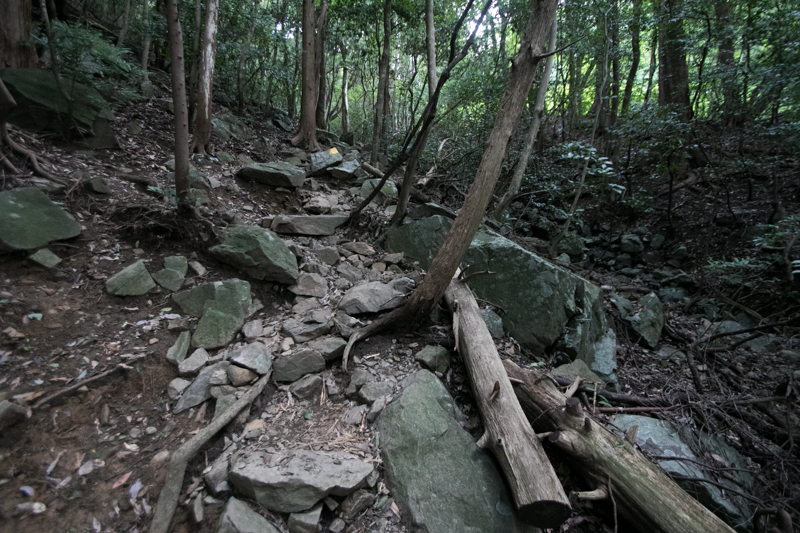 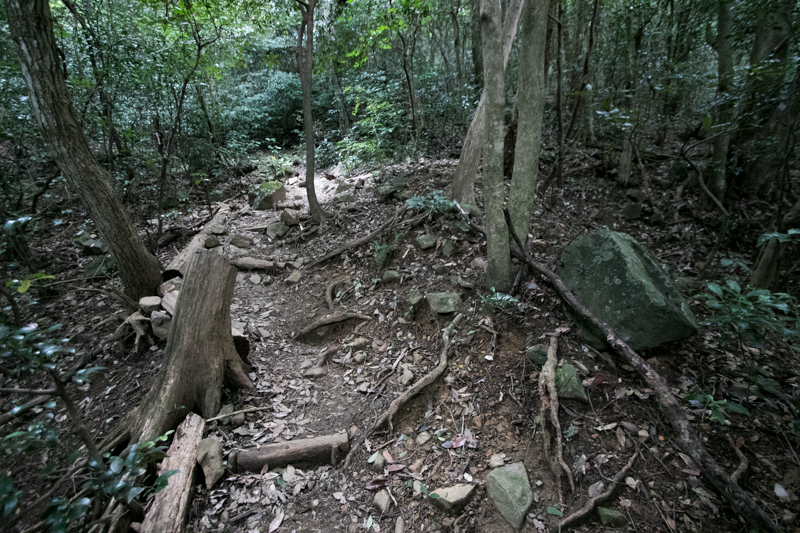 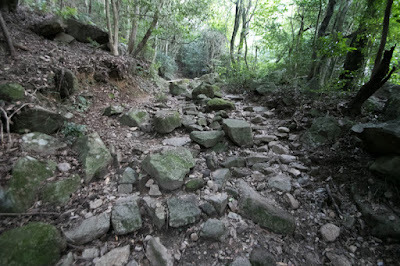 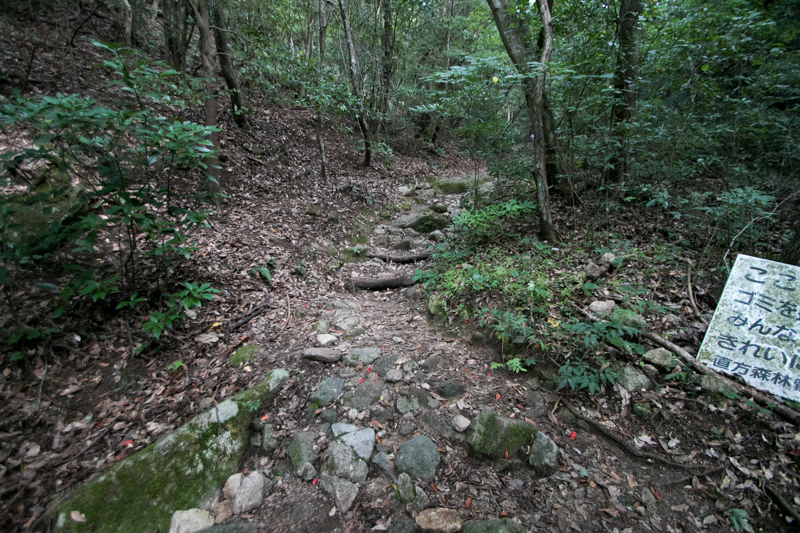 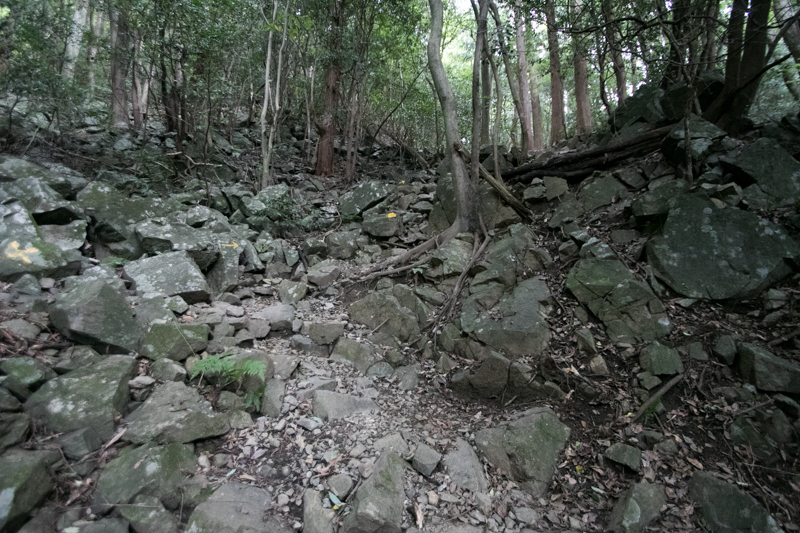 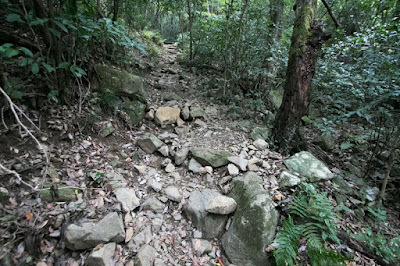 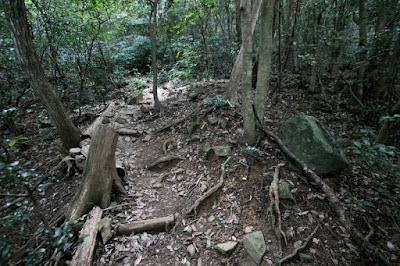 Takatori-yama mountain is a good approach route toward Fukuchi-yama mountain, and by keeping troops there it might be possible to capture Fukuchi-yama mountain quickly. 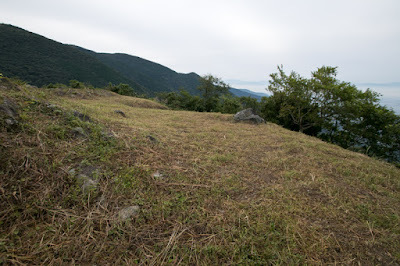 In case Fukuchi-yama mountain was lost, Kuroda army could retreat to Takatoriyama castle and obstruct enemy army which tried to go down to flat area and wait for reinforcement army. 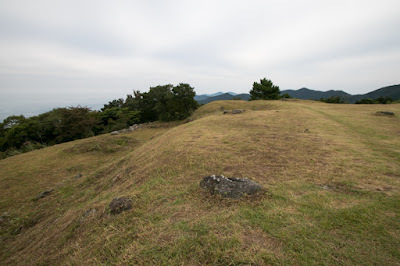 Takatoriyama castle is built at a pear shaped peak area of the mountain and has outer area and inter area. 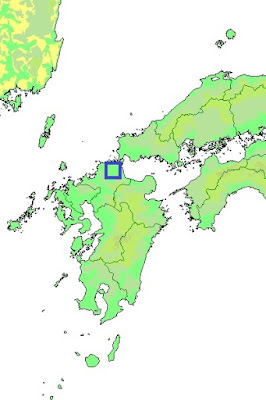 Inner area is a trapezoid area of linearly shaped lines. 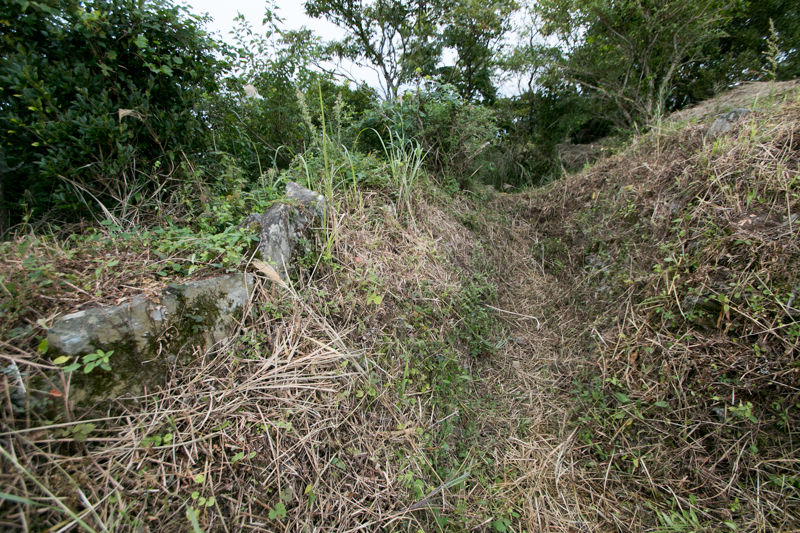 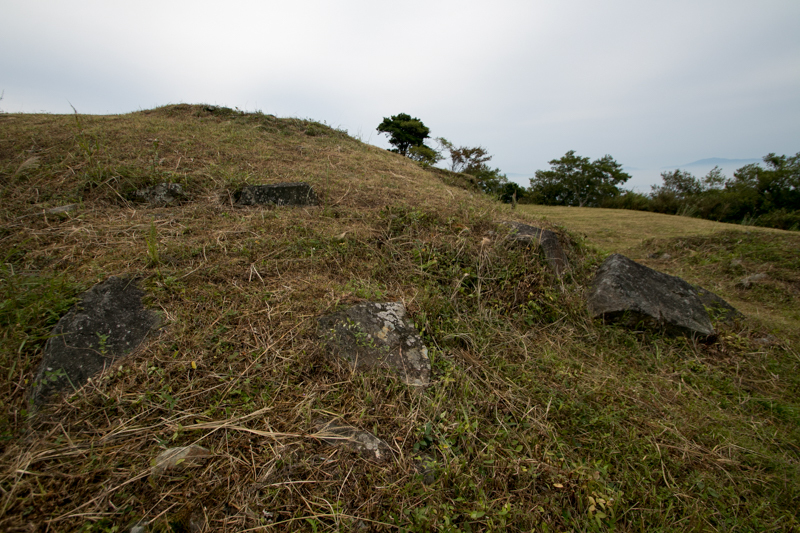 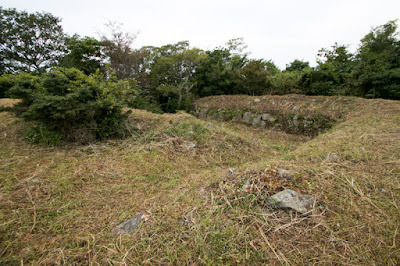 At the southwestern corner there might be the main building of the castle, and two secure Masugata style combined gate existed at the north half of the area. 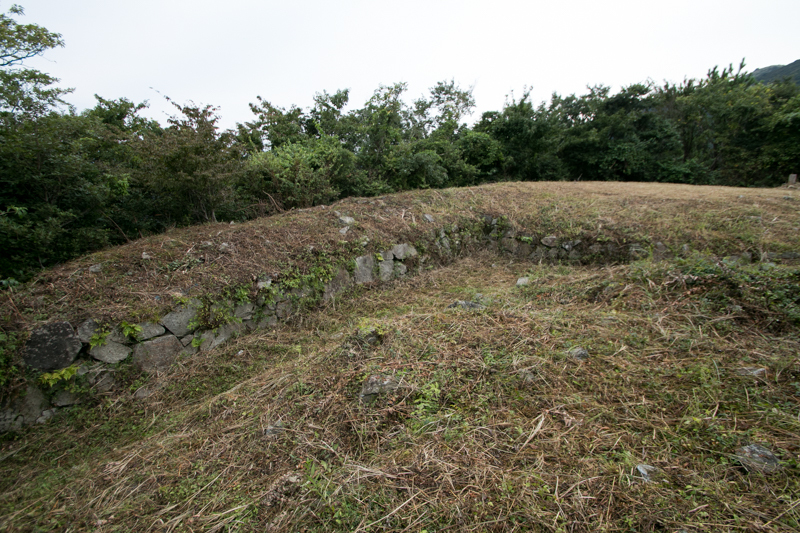 Outer area roundly surrounds the inner area. At the north edge and south edge of the area, there existed two Masugata style gates, the front Eimanji gate which was the front gate at north and South gate as backside gate. 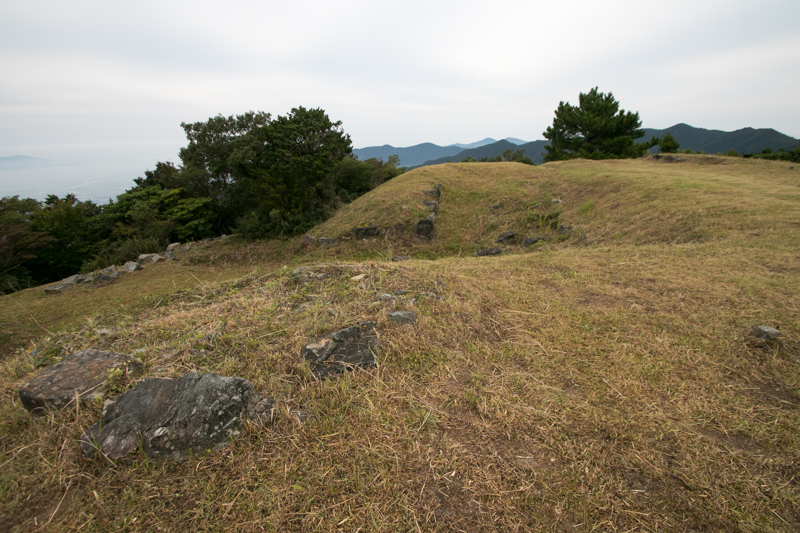 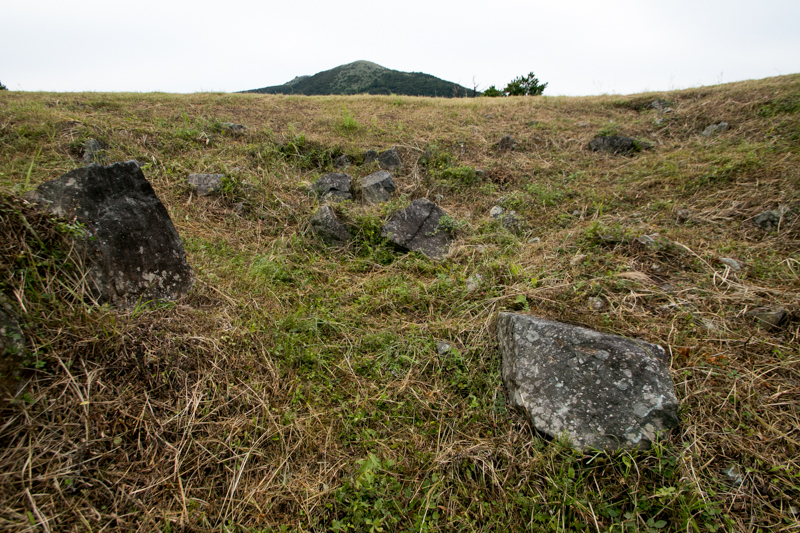 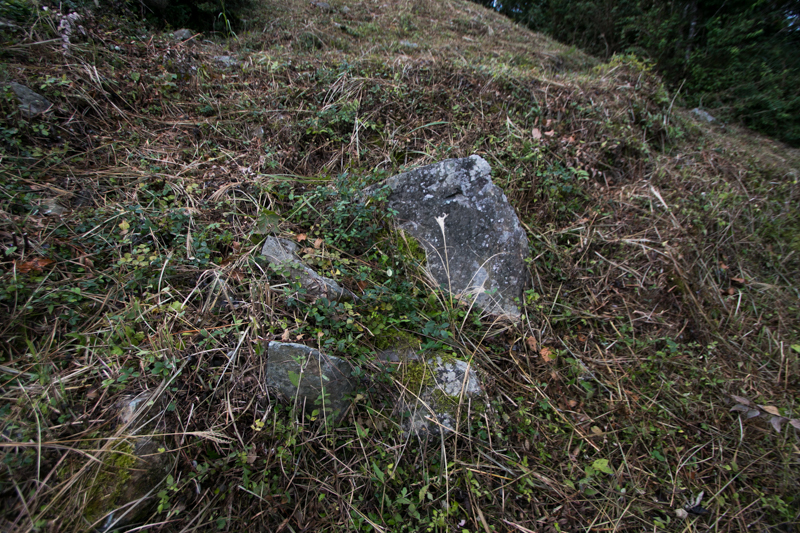 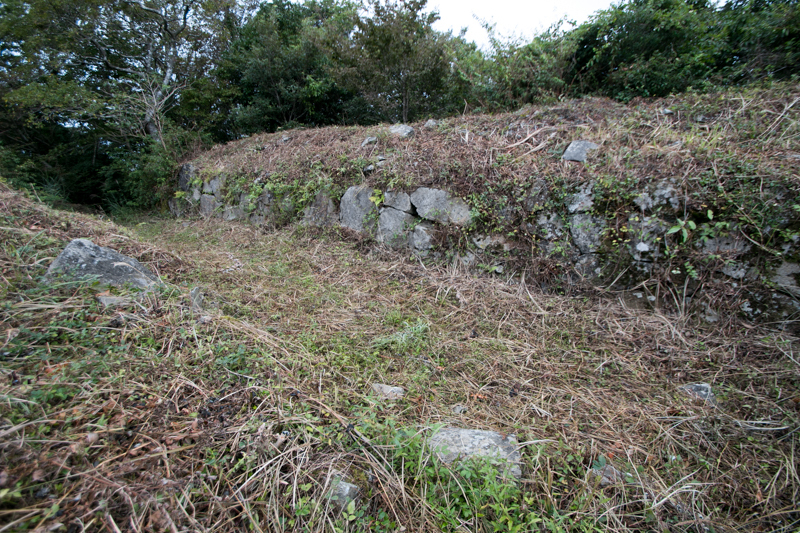 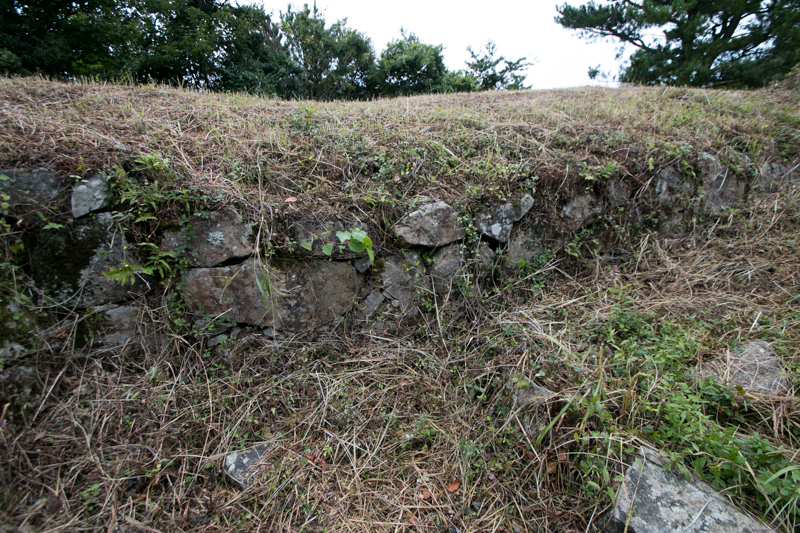 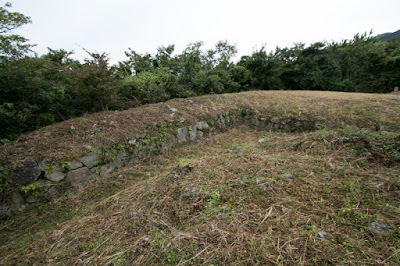 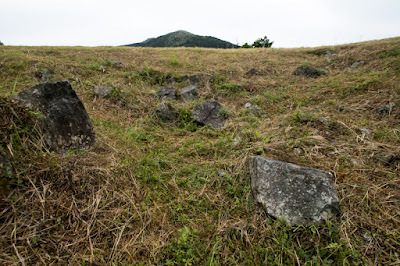 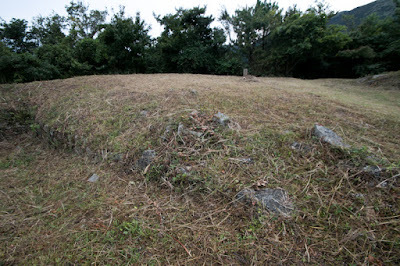 Eastern line of the castle which directly faced Fukuchi-yama mountain was securely protected by barrack tower built at projection of stone walls. 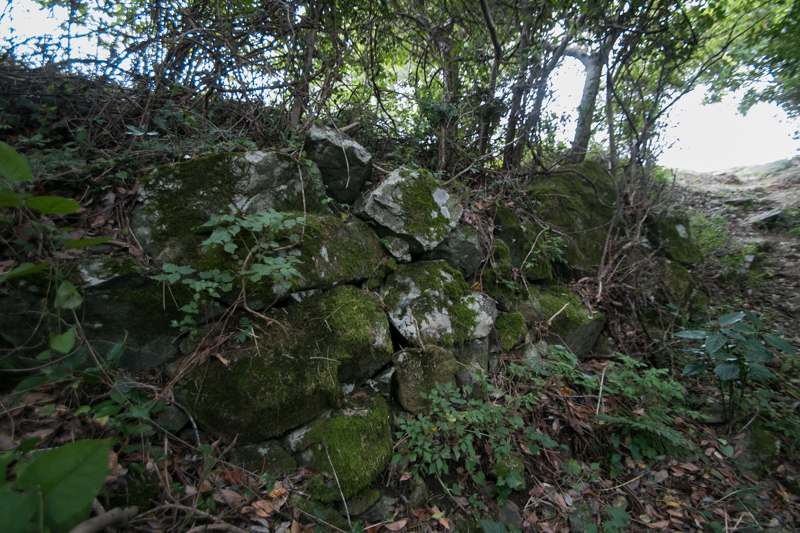 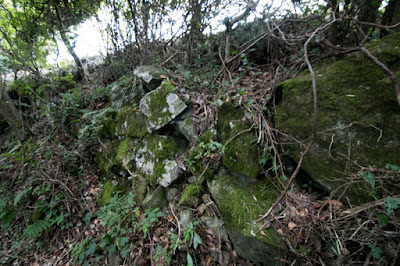 At the north and south of core area there exist the ruin of medieval castles, but these areas was abolished at Kuroda era considering secure core castle and limitation of guardians. The size of the castle at final period was small one of 100 meter long and 50 meter wide, but the security of the castle was equivalent to larger castles. 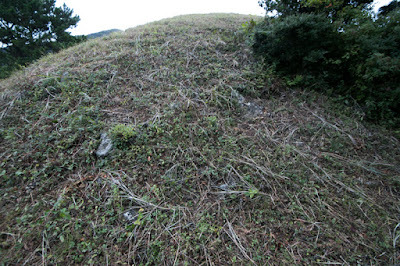 Kuroda clan placed Tomonobu Mori (1556-1615, known as his middle name Tahee) as the commander of Takatoriyama castle. Tomonobu was a brave general who served vanguard of Kuroda army many times, and also activated at the construction of Edo castle or Usa shrine. 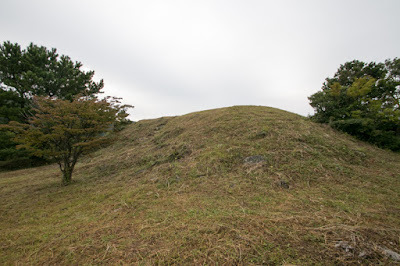 Tomonobu was also famous for the fact that he won the drinking game imposed from Masanori Fukushima (1561-1624), a brave and hard drinking lord. Tomonobu won this match and achieved Nihon-go spear, a famous one originally kept by Imperial Household then was given to Masanori through his master Hideyoshi Toyotomi. 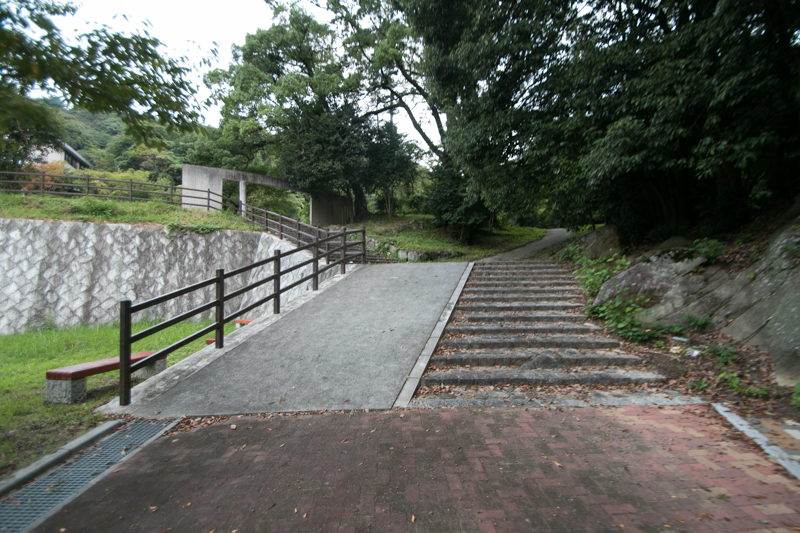 Tomonobu gained fame, and this fact is mentioned at local folk "Kuroda-bushi". 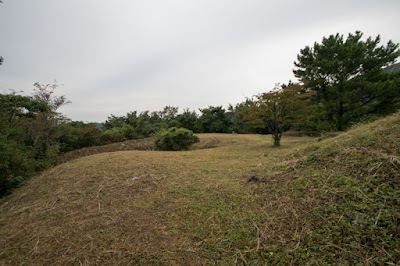 In 1606, after the exile of Mototsugu Goto (1560-1615), the commander of Masutomi castle and who later joined Toyotomi army at the battle of Osaka castle and showed brilliant battle, Tomonobu Mori moved to Masutomi castle. 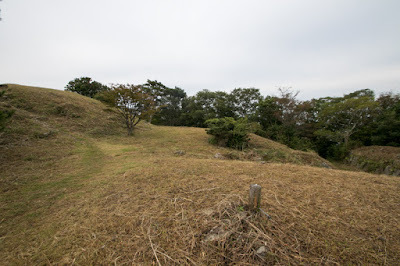 Soon after that Takatoriyama castle was abolished along with other branch castles, under Ikkoku Ichijo Rei (one domain one castle rule) published at that year. 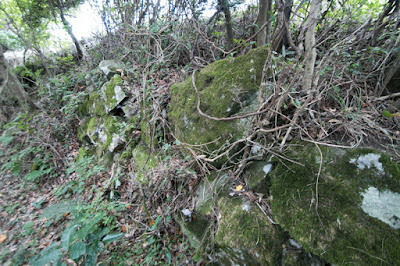 Now most part of stone walls was destructed thus only shape of terrain remains along with slightly remaining line of stones. 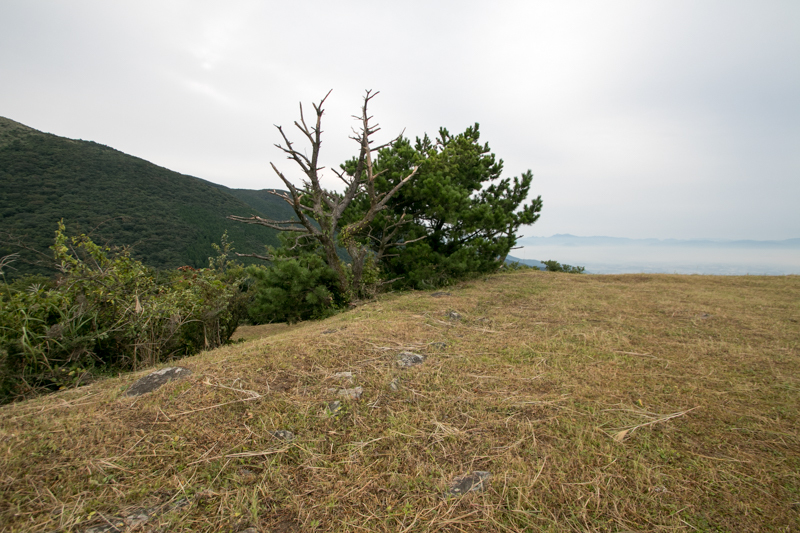 Even though a small branch castle but the record of height for the place of modern castle lives long, along with spectacular scenery from the castle sight. 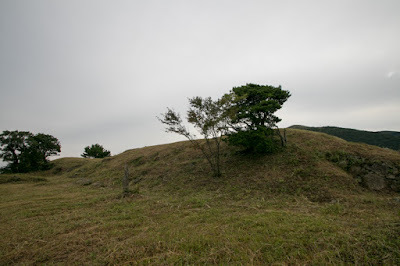 It is not clear if this castle was practical or not, but this small castle has big impression for its difficulty of visit and wonderful scenery from it. 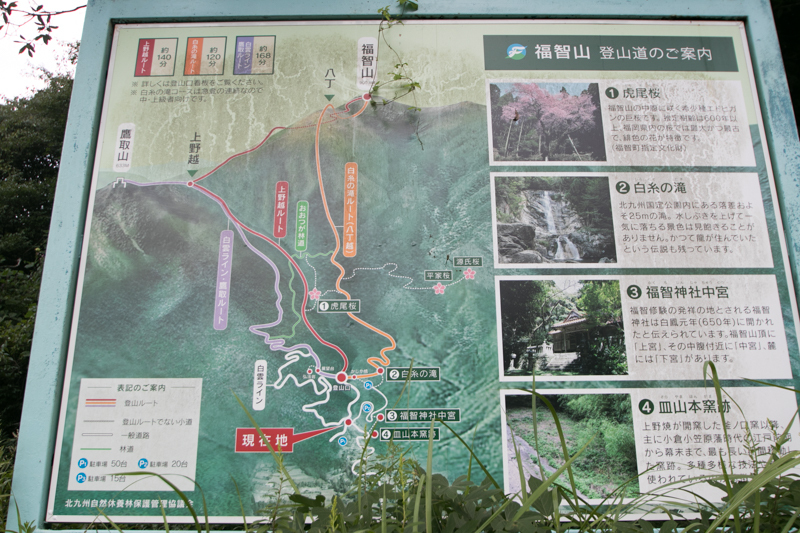 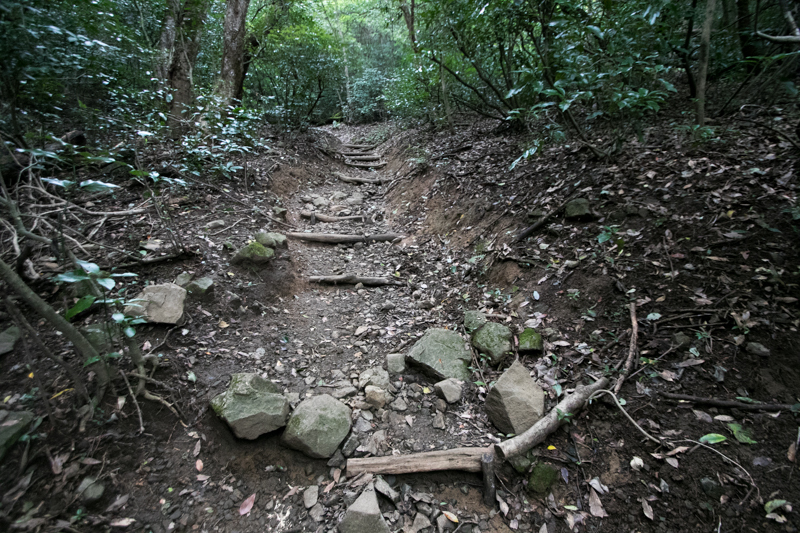 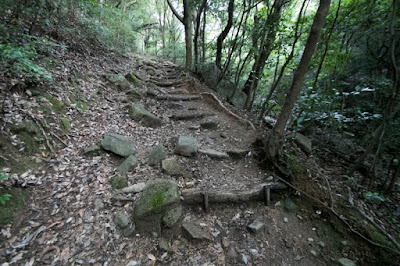 40 minutes walk from the entrance of climbing road to Fukuchi-yama mountain near Shiroito-no-taki fall to the diverging point toward Takatori-yama mountain, and another 10 minutes walk to castle site. 20 minutes drive from Kyushu Jidoshado Expressway Yahata interchange to the entrance of climbing road.